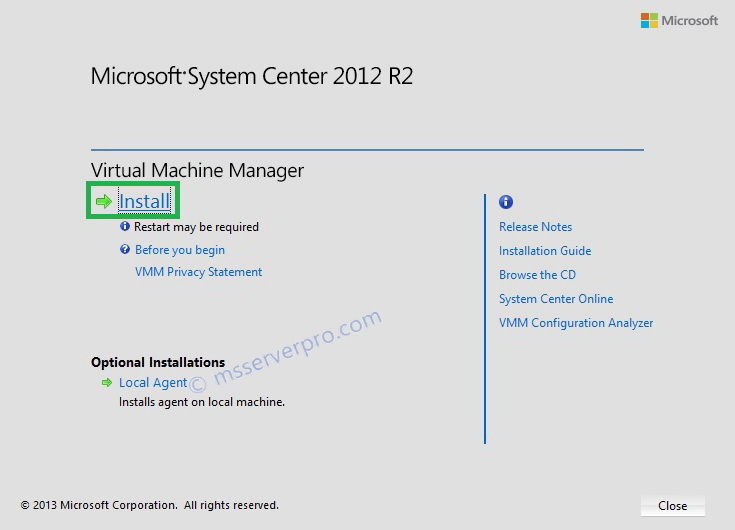 Virtual Machine Manager(VMM) is a component of System Center 2012 R2 that manages solution for the virtualized data center, enabling you to create and deploy virtual machines and services to private clouds by configuring and managing your virtualization hosts, networking and storage resources. 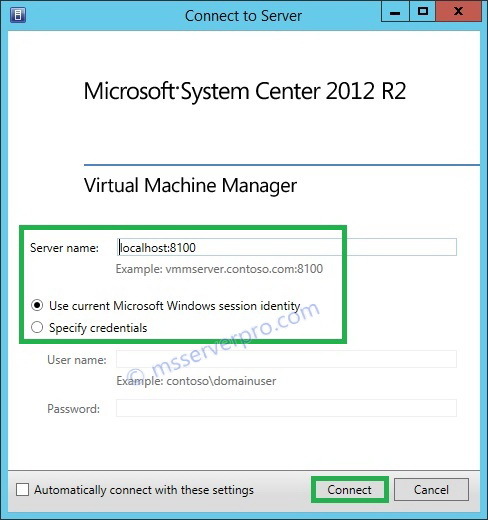 In System Center 2012 R2, a VMM Server can support up to 1,000 hosts and 25,000 virtual machines. 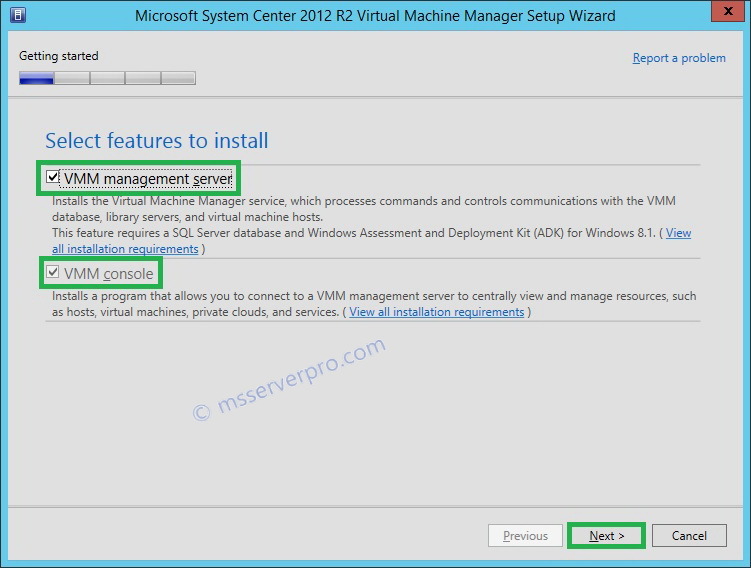 This is my first article on VMM server so I start from the Installation. 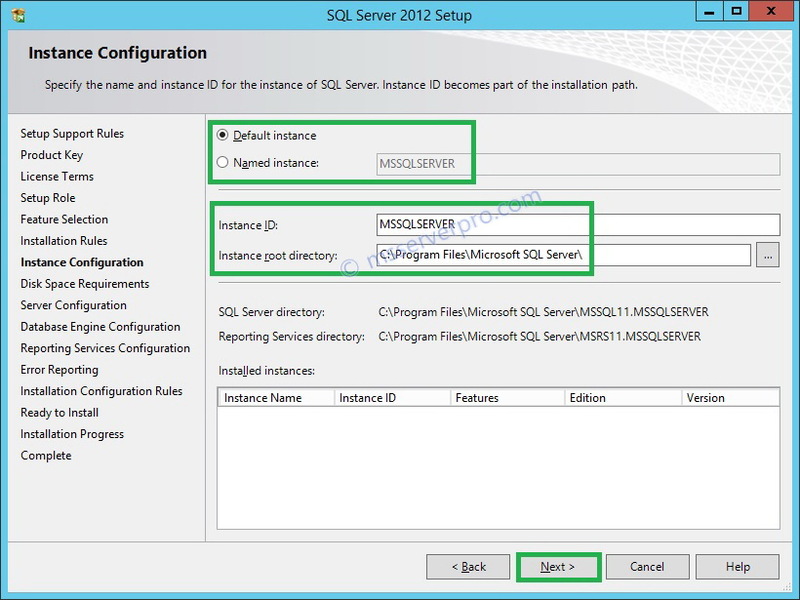 In our lab, you will install VMM Management Server and SQL Server Database on different computers. 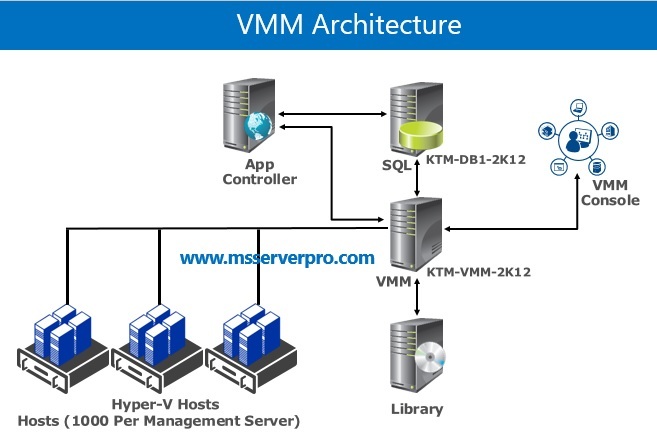 The VMM architecture and lab details are given below. 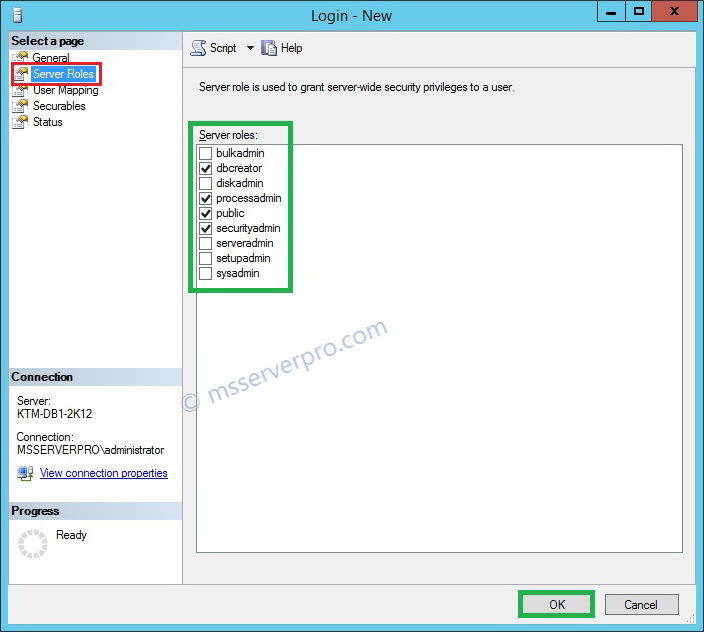 In Active Directory, Create a SCVMM service accounts for VMM Management Server and VMM Database Server. 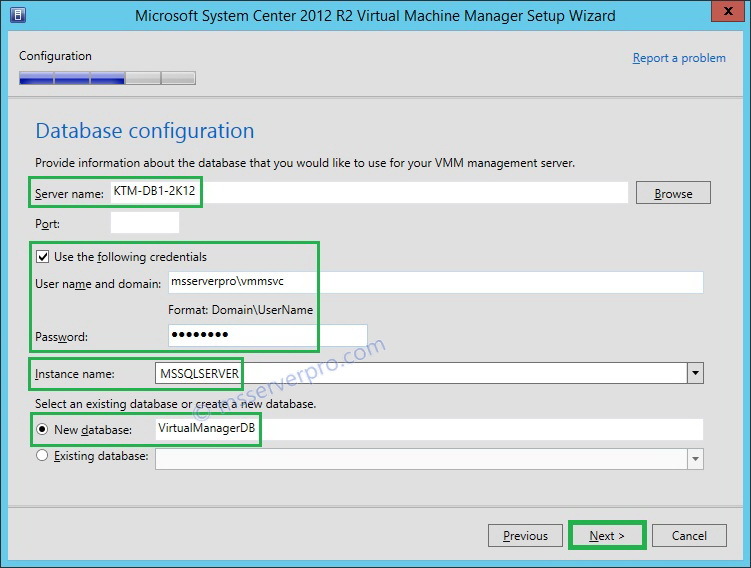 The VMM Management server and VMM Database server must be member of an Active Directory domain. 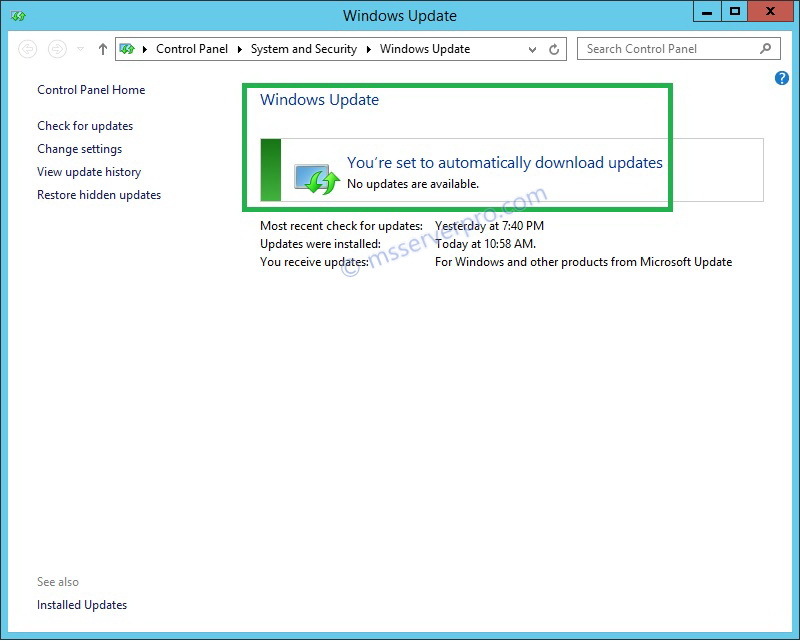 Choose Windows Update settings, Run Windows Updates, and then Install latest Windows Updates on these servers. 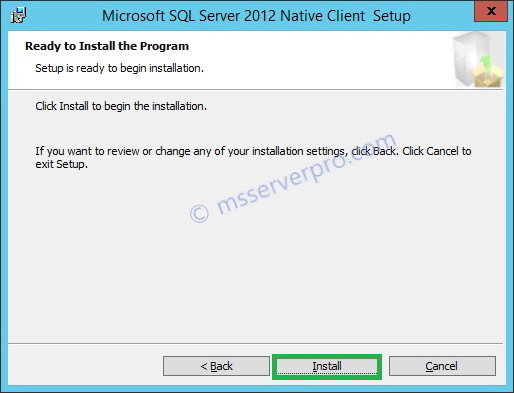 Install the SQL Server Database Engine for VMM implementation, when you Install SQL Server, select the Database Engine Services and the Management Tools- Complete features. 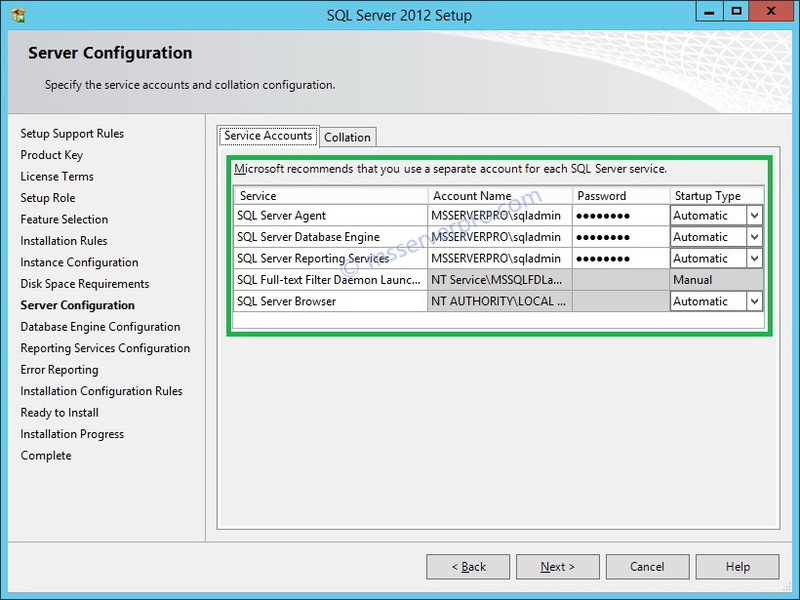 Configure SQL Server Roles to SCVMM Service Account. 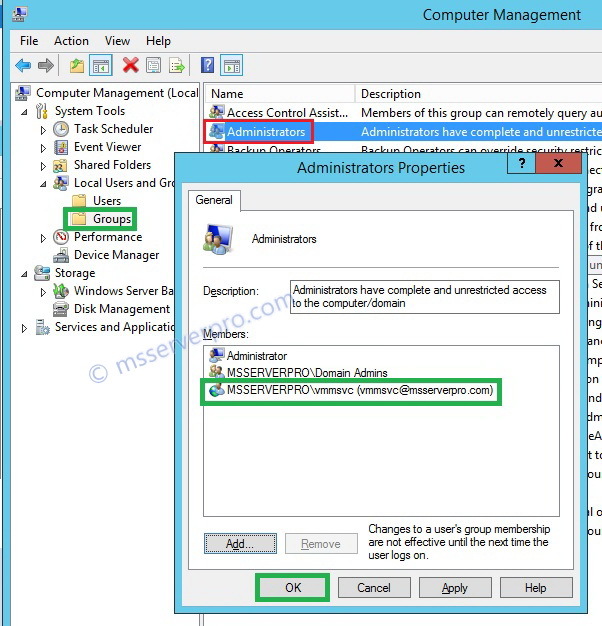 Add SCVMM Service account to Local Administrators members in VMM Management Server. 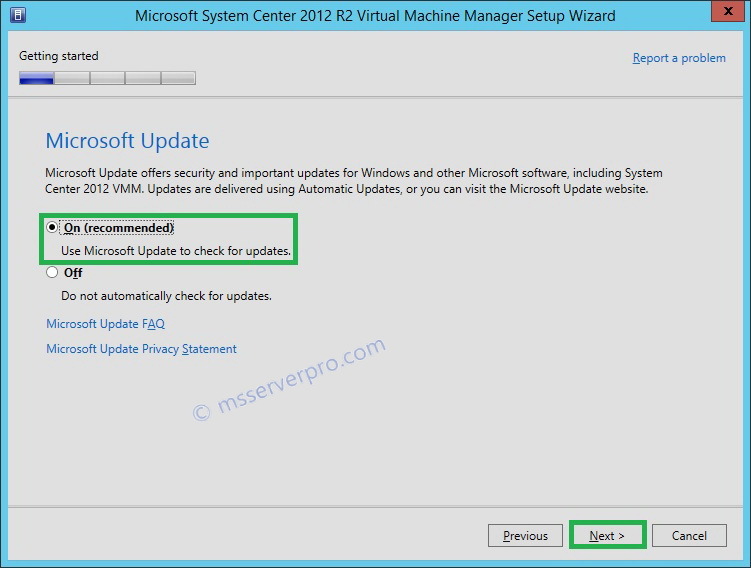 Installing VMM dependencies on the SCVMM server, install the Windows Assessment and Deployment Kit (ADK) for Windows 8.1, select the Deployment Tools and the Windows Preinstallation Environment features and install Microsoft SQL Server 2012 Feature Pack, SQL Server Command Line Utilities and Microsoft SQL Server 2012 Native Client. 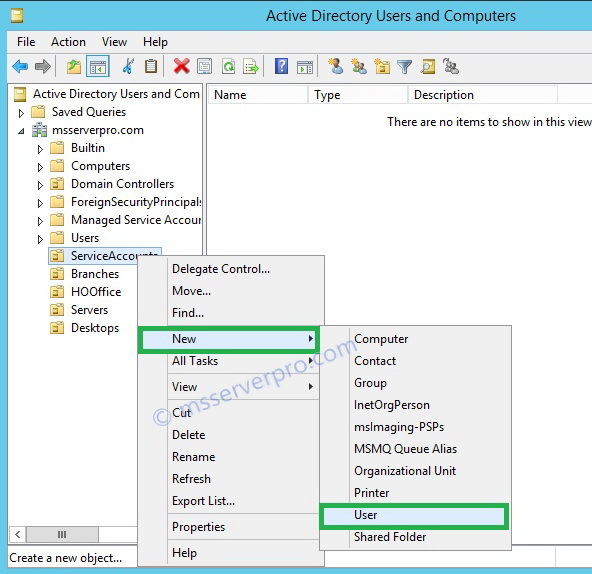 In Server Manager, click Tools, and then click Active Directory Users and Computers. 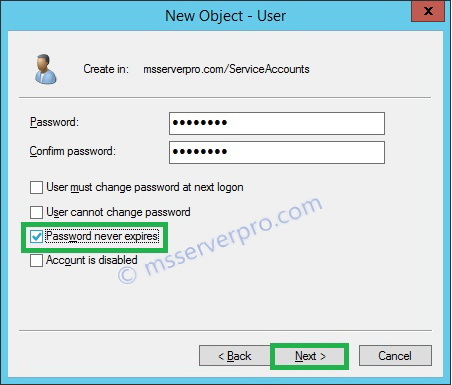 In Active Directory User and Computers console, expand msserverpro.com, Right-click ServiceAccounts OU, point to New, and then click User. 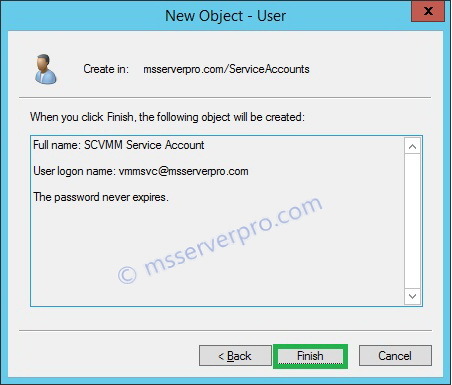 In the New Object- User dialog box, in First name, type vmmsvc, in Full name, type SCVMM Service Account, in User login name, type vmmsvc and click Next. 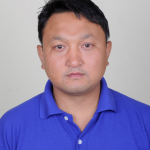 In Password and Confirm password, type P@ssw0rd. Select the Password never expires check box, and then click Next. 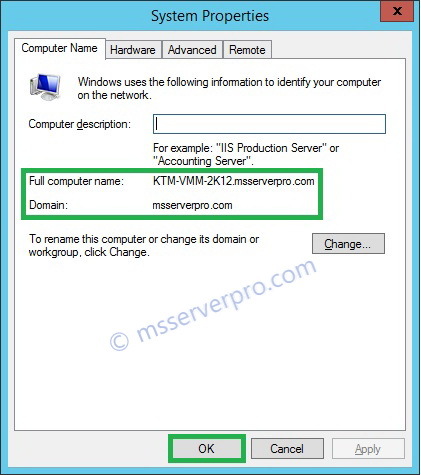 On KTM-DC1-2K12, Log in as Domain Administrator, In Server Manager, click Tools, and then click ADSI Edit. 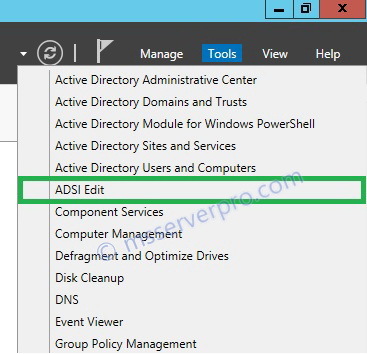 On the ADSI Edit page, Right-click on ADSI Edit and select Connect to..
On the Connection Settings dialog box, select Default naming context and click OK. 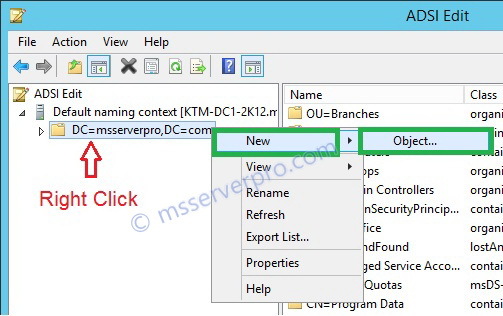 Expand Default naming context [KTM-DC1-2K12.msservepro.com], Right-click on DC=msserverpro.com,DC=com and select New and then click Object..
On the Create Object dialog box, click container and then click Next. 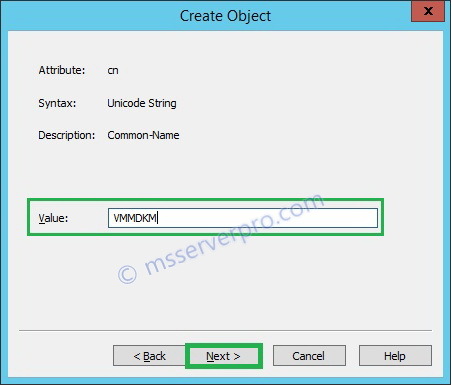 On the Create Object dialog box, in the Value textbox, type VMMDKM and then click Next. 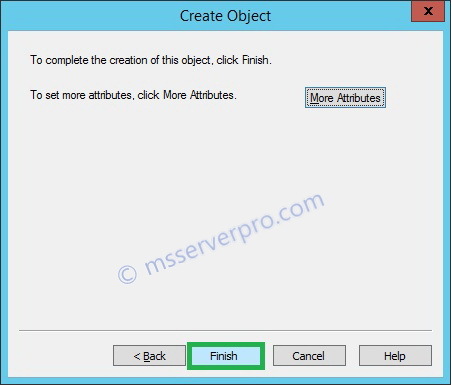 On the Create Object dialog box, Click Finish. On the ADSI Edit page, Right-click on CN=VMMDKM and select Properties. 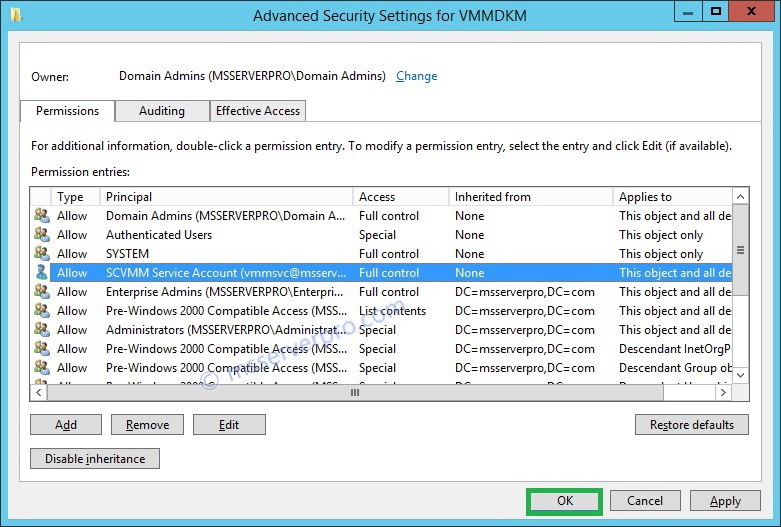 On the CN=VMMDKM Properties dialog box, Click Security Tab and then click Advanced. 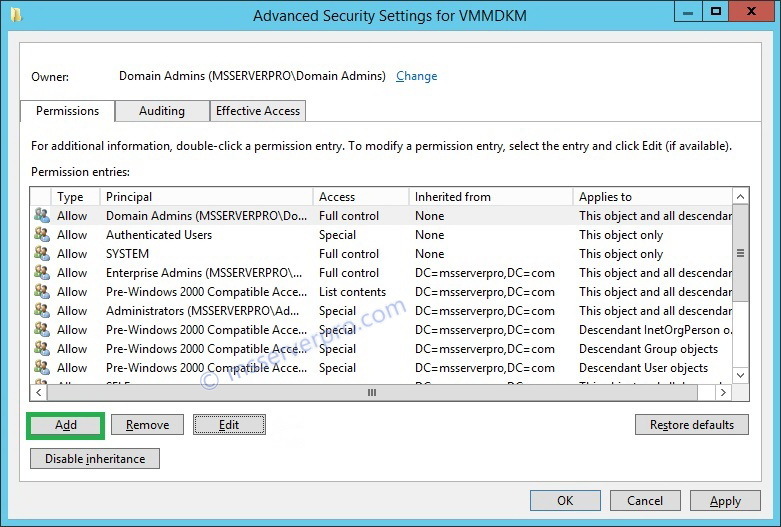 On the Advanced Security Settings for VMMDKM dialog box, select Domain Admins and then click Edit. 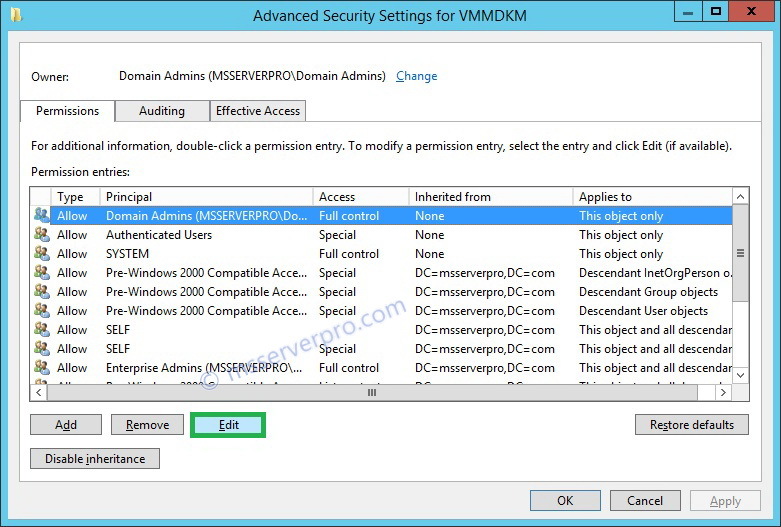 On the Permission Entry for VMMDKM dialog box, in the Applies to drop-down menu, select This object and all descendant objects .In Permissions section make sure Full control check box is selected and click OK.
On the Advanced Security Settings for VMMDKM dialog box, Click on Add. 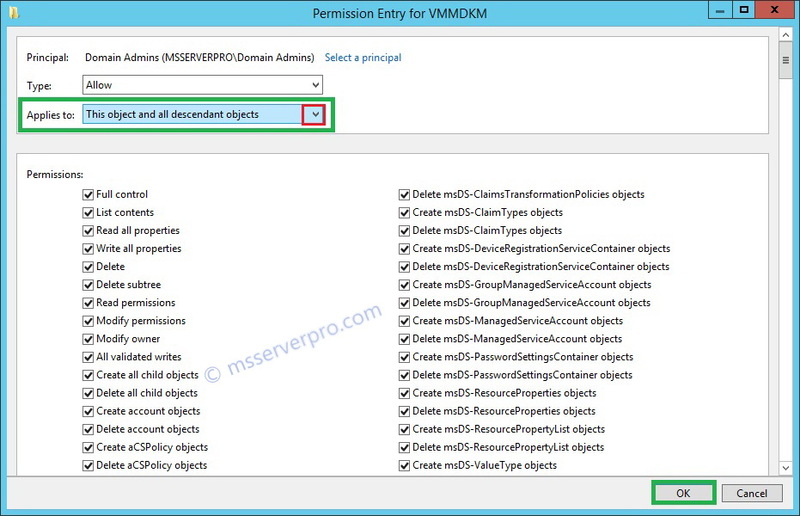 On the Permission Entry for VMMDKM dialog box, click on Select a principal. 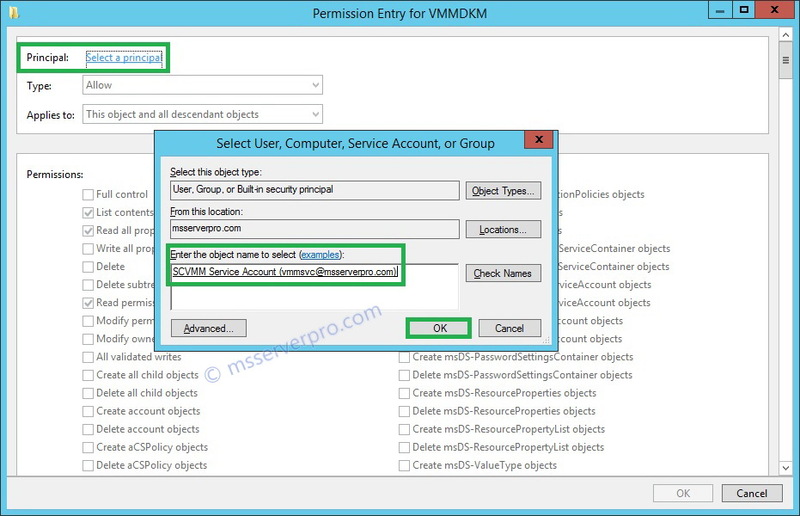 On the Select User, Computer, Service Account, or Group dialog box, type SCVMM Service Account (vmmsvc@msserverpro.com) and click OK.
On the Permission Entry for VMMDKM dialog box, in the Applies to drop-down menu, select This object and all descendant objects. 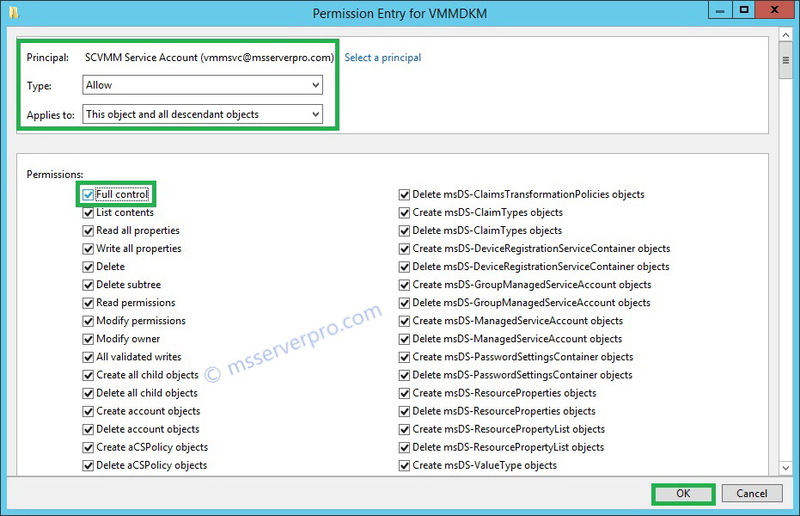 In Permissions section, click on Full control and click OK.
On the Advanced Security Settings for VMMDCK dialog box, click OK.
On the CN=VMMDKM Properties dialog box, click Attribute Editor tab, select distinguishedName and click View. 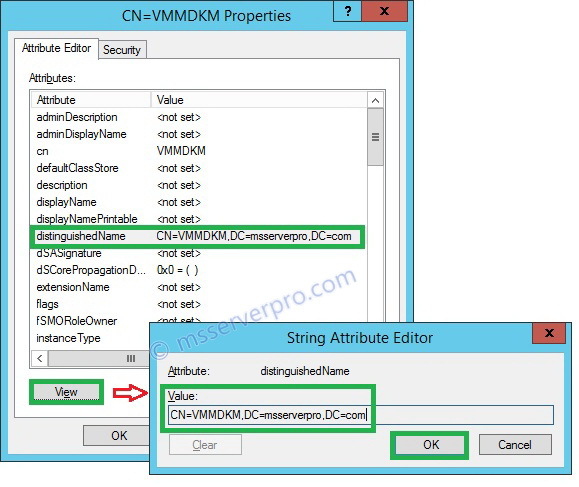 On the String Attribute Editor box, please note the distinguishedName Value: CN=VMMDKM,DC=msserverpro,DC=com and click OK. We need this value during installation of SCVMM. 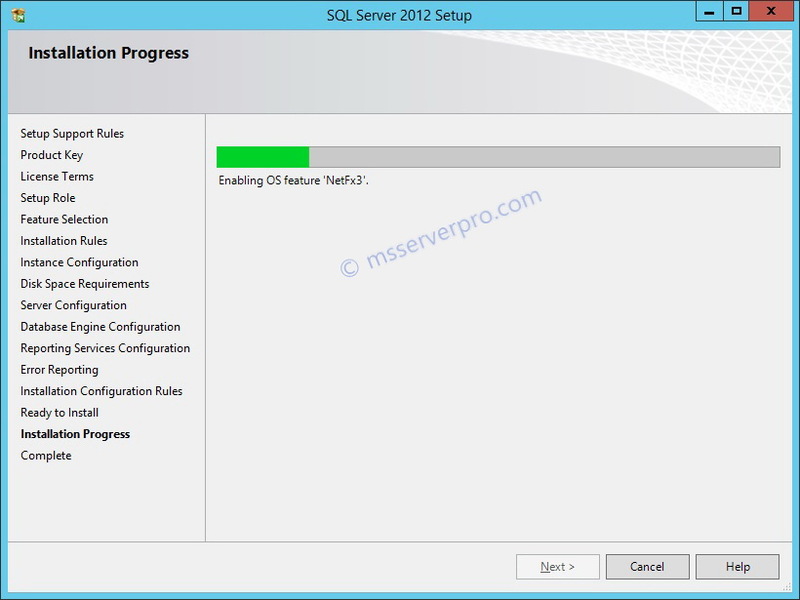 Log on KTM-DB1-2K12, double-click SQLServer setup drive and wait for SQL Server Setup to start. 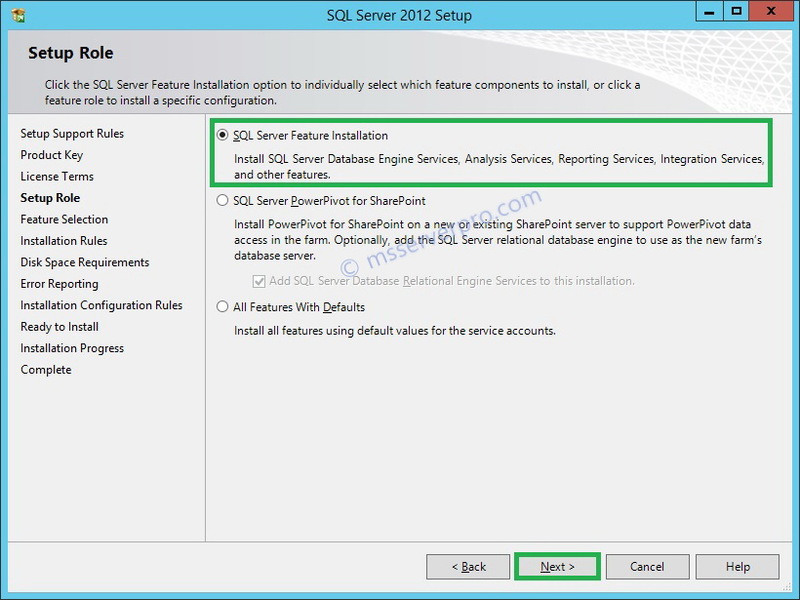 In the SQL Server Installation Center window, click on the Installation tab, and then click New SQL Server stand-alone installation or add features to an existing installation from the list of available options and wait for SQL Server setup to start. 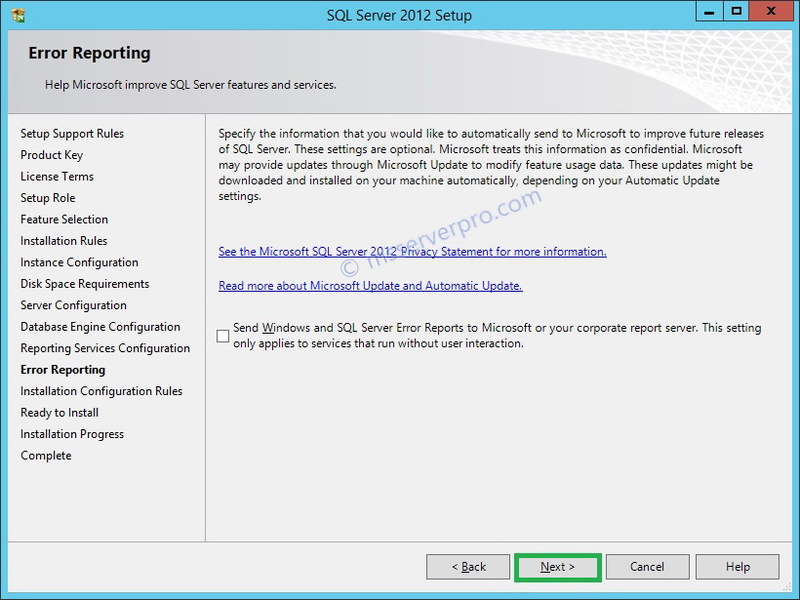 On the Setup Support Rules window, click OK.
On the Product Updates window, check Include SQL Server product updates and click Next. 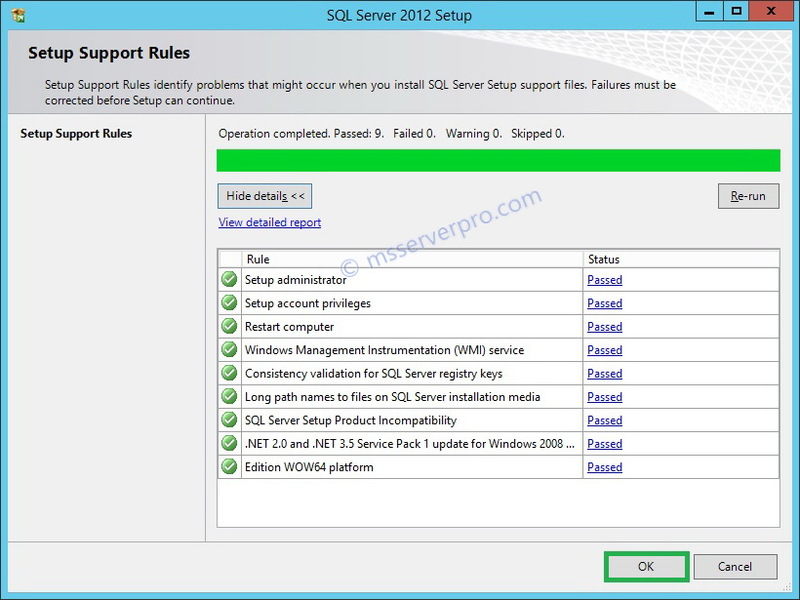 On the Setup Support Rules page, click Show details and read the installation checklist and check to make sure the status for items have Passed. Note any warnings that are listed and click Next. 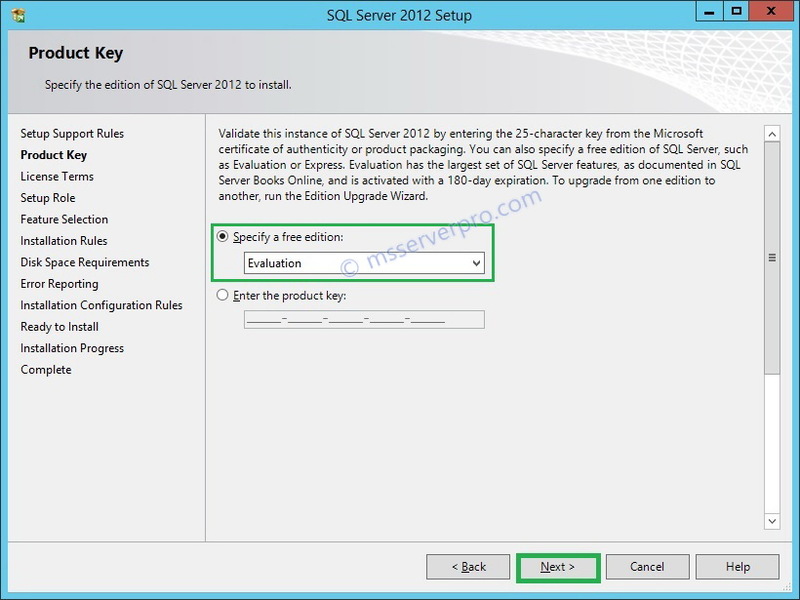 On the Product Key window, click Next. 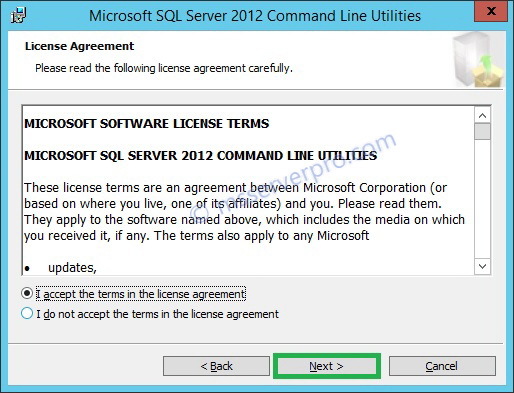 On the License Terms page, check I accept the license terms and click Next. 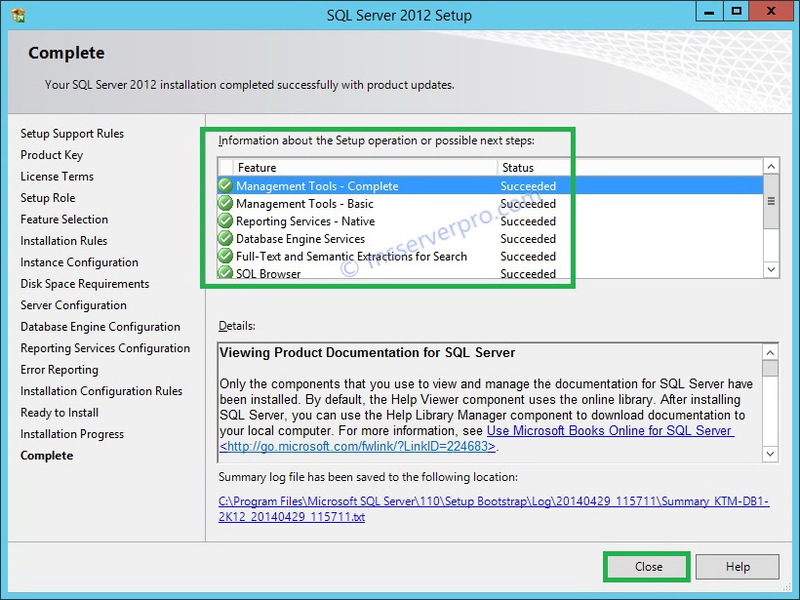 On the Setup Role page, ensure that SQL Server Feature Installation is selected and click Next. 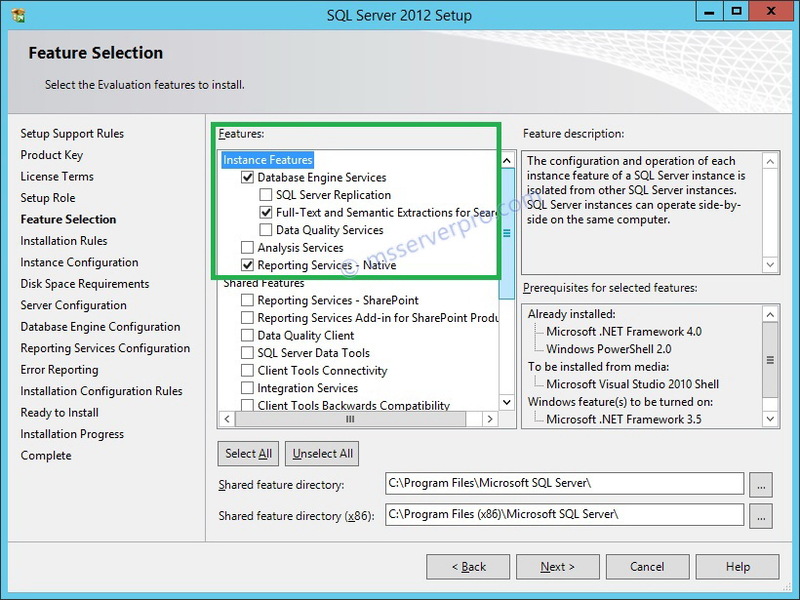 On the Feature Selection page, under the Instance Features check Database Engine Services, Full-Text and Semantic Extractions for Search, Reporting Services –Native, and Management Tools-Basic and Complete (for running queries and configuring SQL services) and click Next. 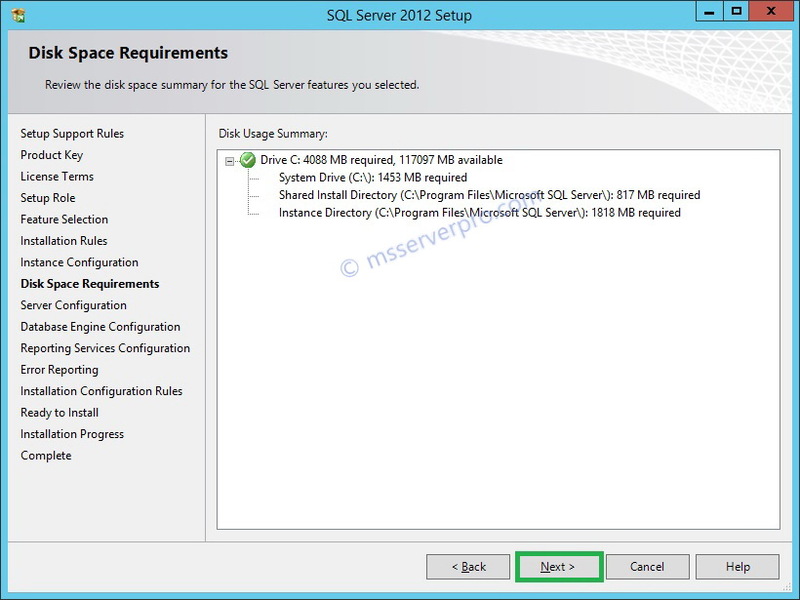 Here, I am going to setup a shared SQL Server for other System Center components. 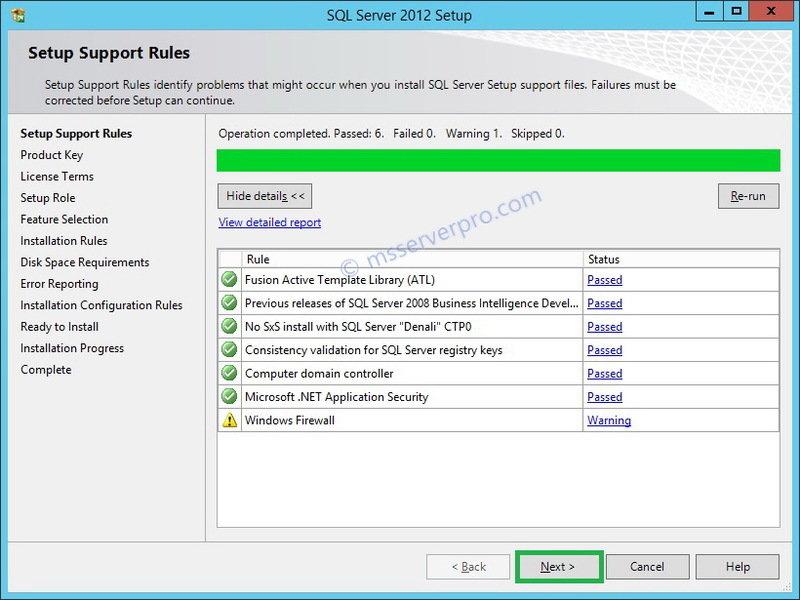 On the Installation Rules page, click Show details, note the list of rules and the status of each rule and click Next. 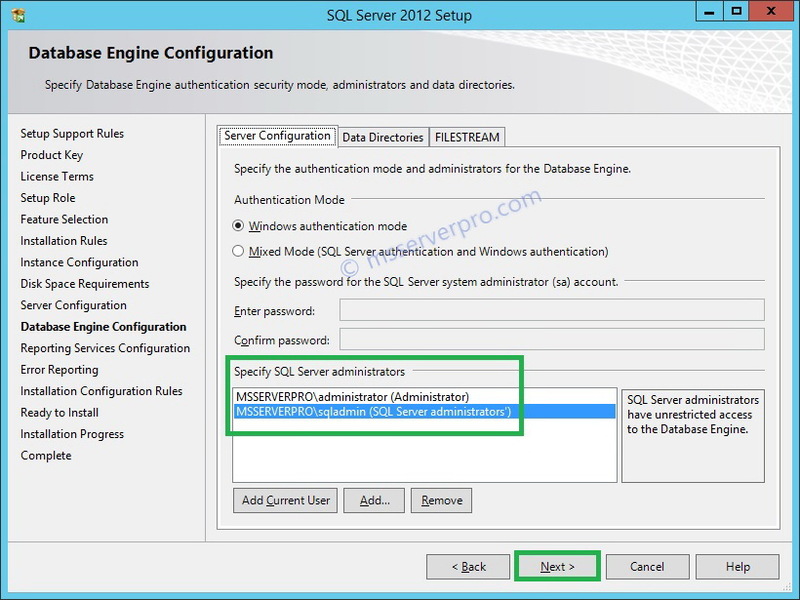 On the Server Configuration page, click the Account Name field for the SQL Server Agent row and select <<Browse…>> from the drop-down list. 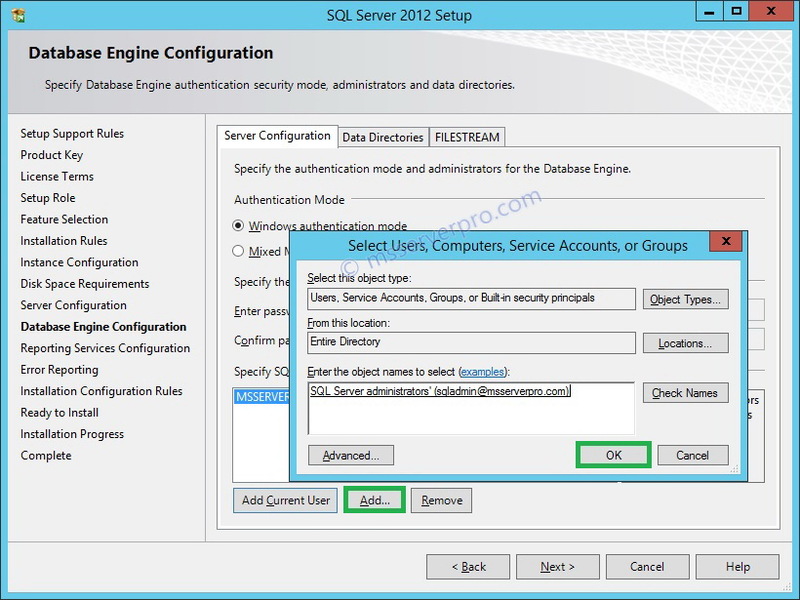 In the Select User, Computer, Service Account, or Group window, in the Enter the object name to select (Examples): dialog box type sqladmin, click Check Names and click OK. Do the same process for SQL Server Database Engine and SQL Server Reporting Services. 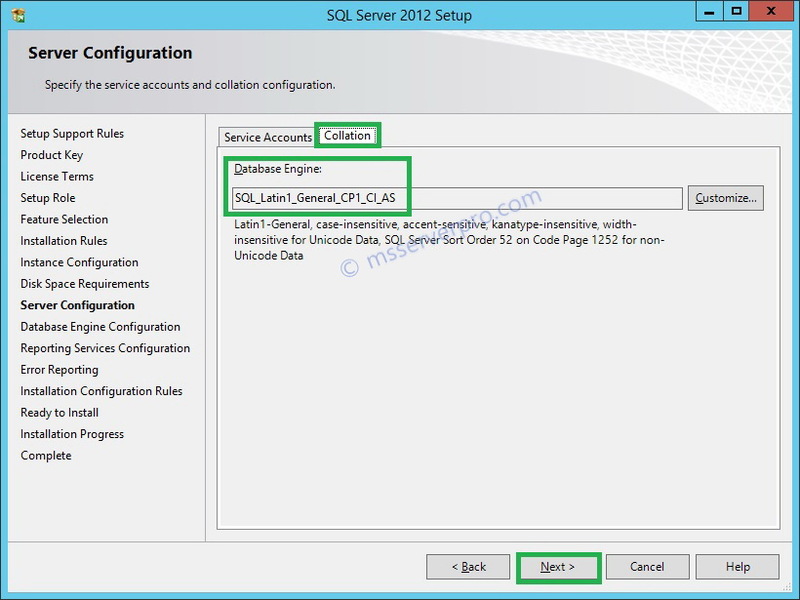 Click the Collation tab, ensure that SQL_Latin1_General_CP1_CI_AS is selected and click Next. 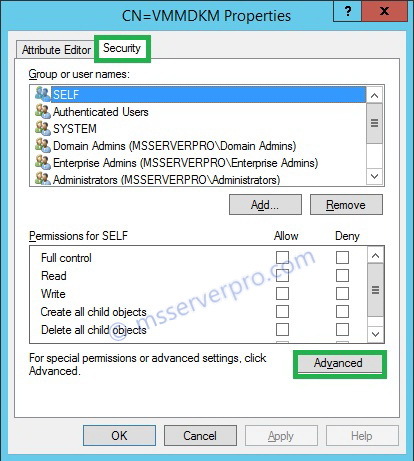 On the Database Engine Configuration page, on the Server Configuration tab, in the Authentication Mode section, ensure that Windows authentication mode is selected. 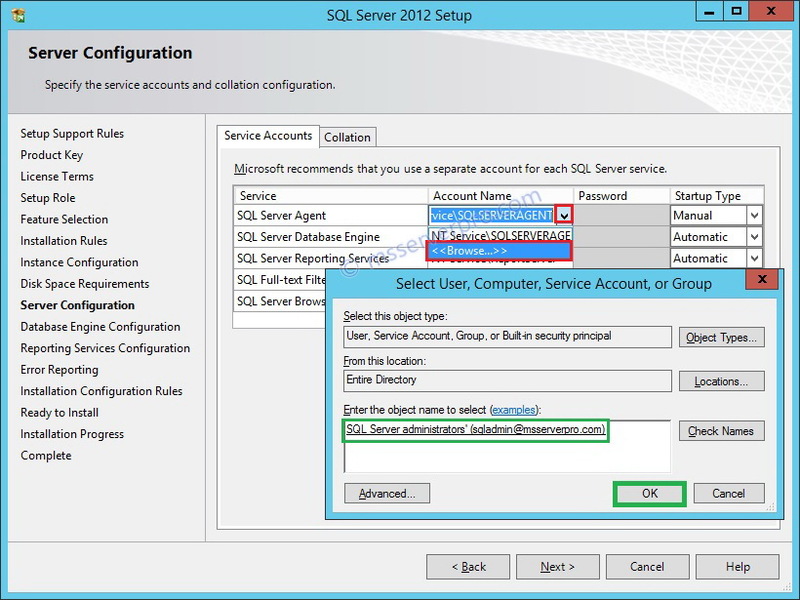 Click Add Current User, this will add the user MSSERVERPRO\administrator (Administrator) to the list of Administrators. 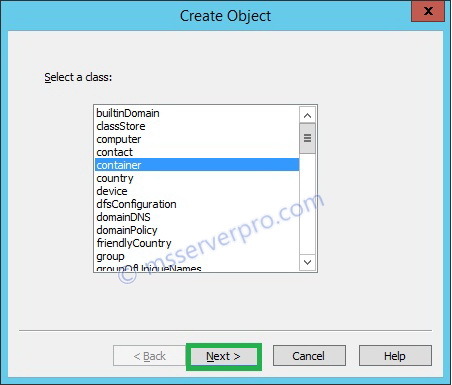 Click Add .In the Select User, Computer, Service Account, or Group window, in the Enter the object name to select (Examples): dialog box type sqladmin, click Check Names and click OK. Then Click Next. 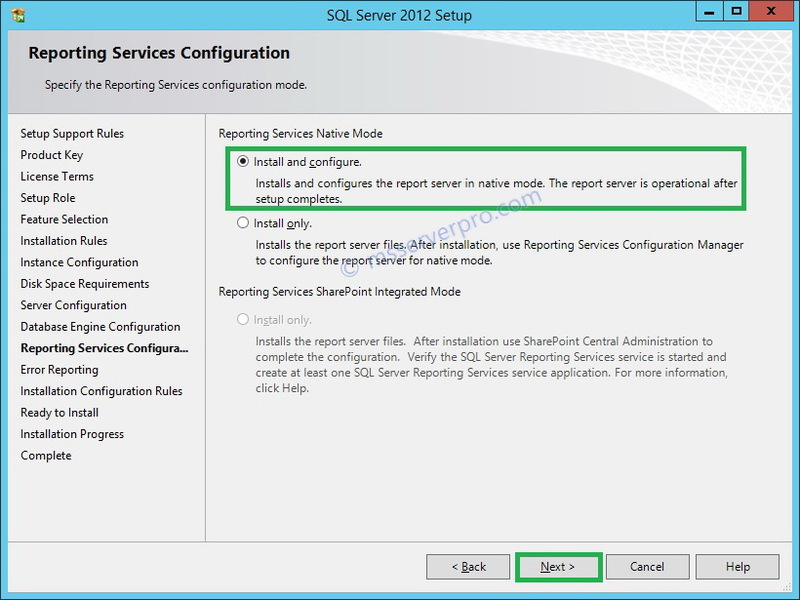 On the Reporting Services Configuration window, ensure that Install and configure is selected and click Next. 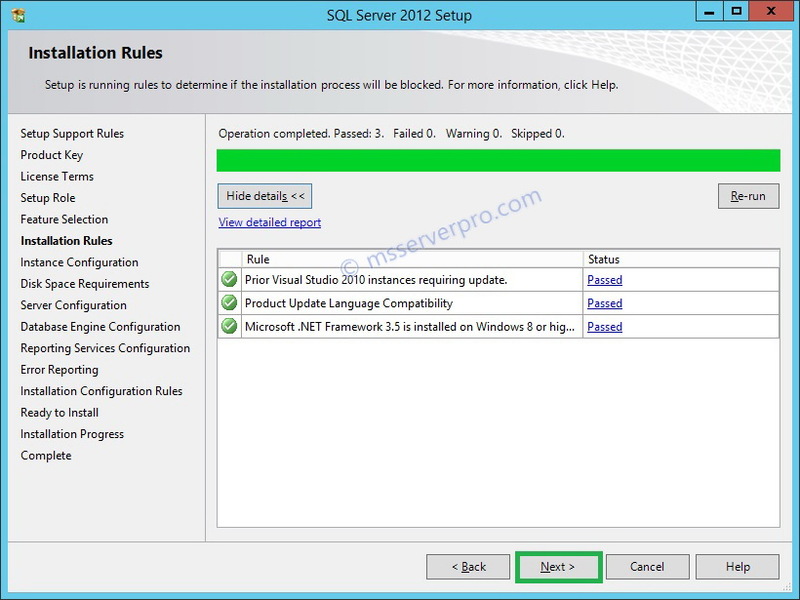 On the Installation Configuration Rules page, Show details, review the list of rules, and click Next. 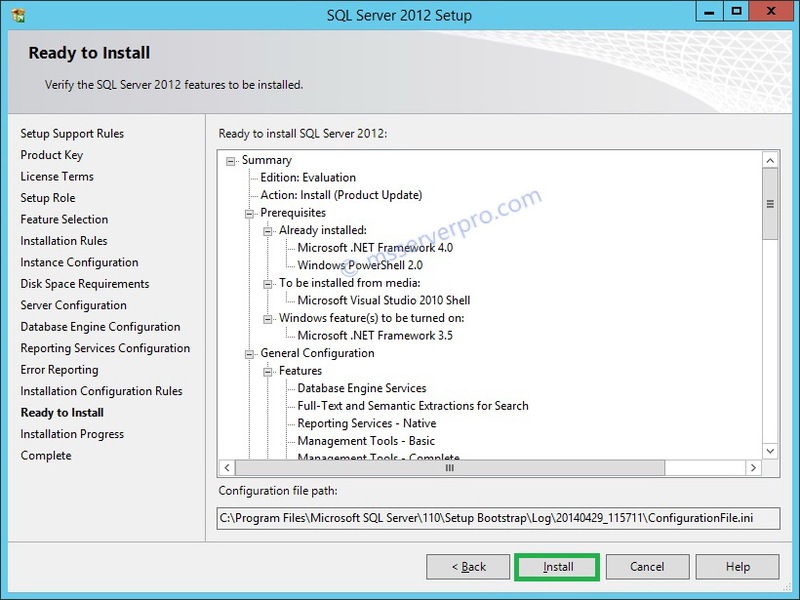 On the Ready to Install page, review the summary and click Install. 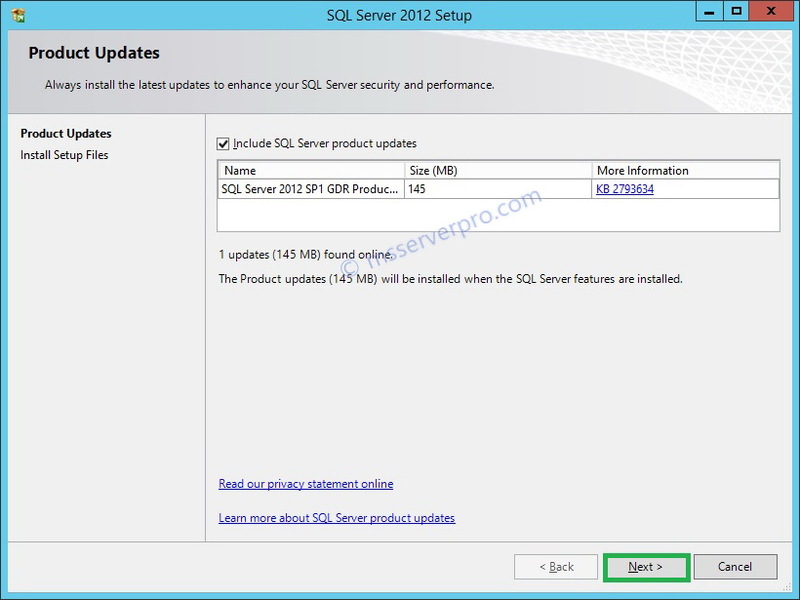 On the Complete page, verify Your SQL Server 2012 installation completed successfully with product updates and click Close. 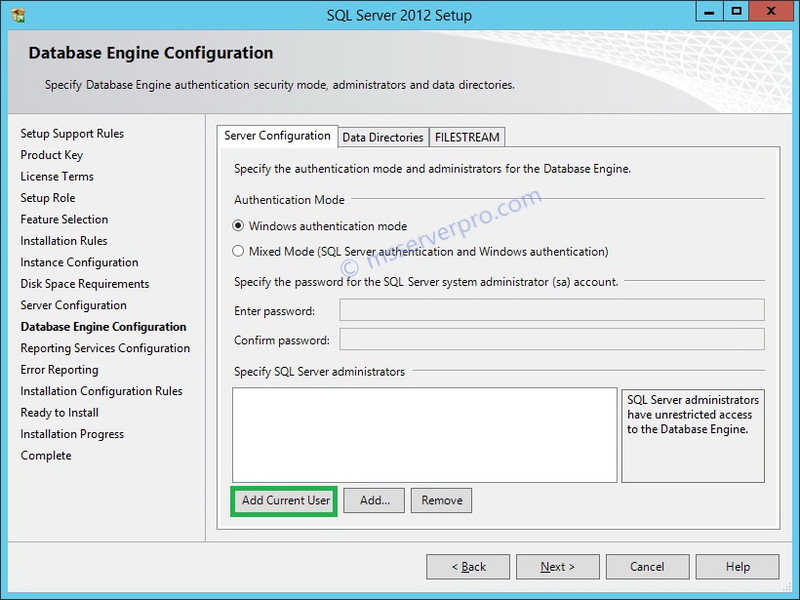 In KTM-DB1-2K12, Open SQL Server Management Studio, In the Connect to Server window, ensure that Server Type is set to Database Engine. 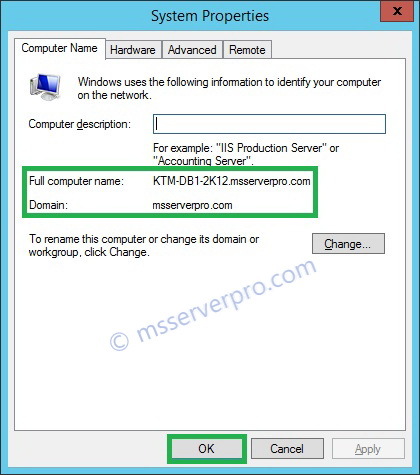 In the Server name test box, ensure KTM-DB1-2K12. 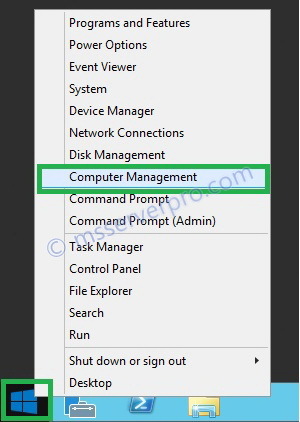 In the Authentication drop-down list, select Windows Authentication, and click Connect. 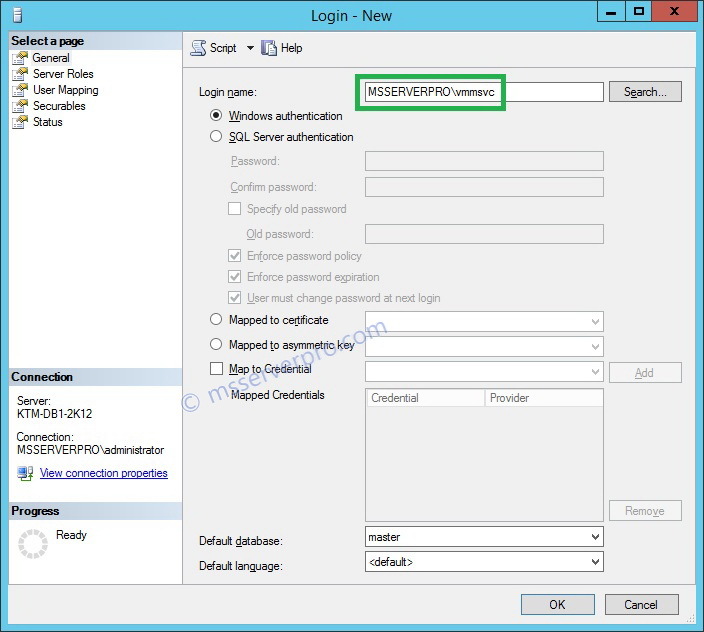 In object Explorer, expand Security, Right-click Logins and the click New Login.. 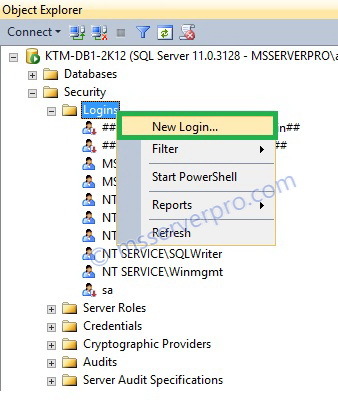 In the Login-New window, click Search.. 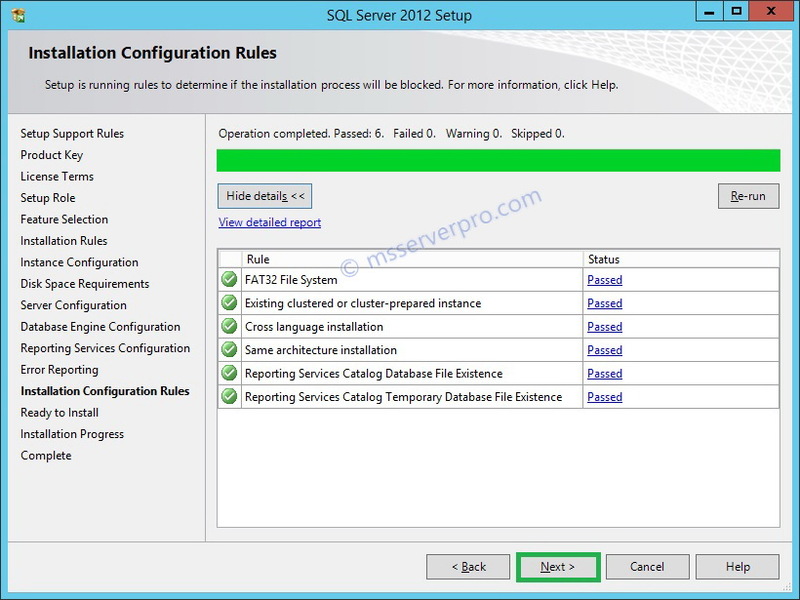 In the Select User or Group window, click Locations.. 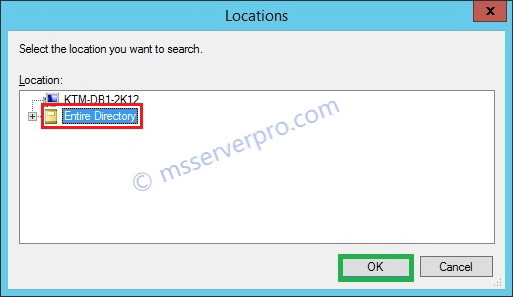 In the Locations window, select Entire Directory and then click OK. 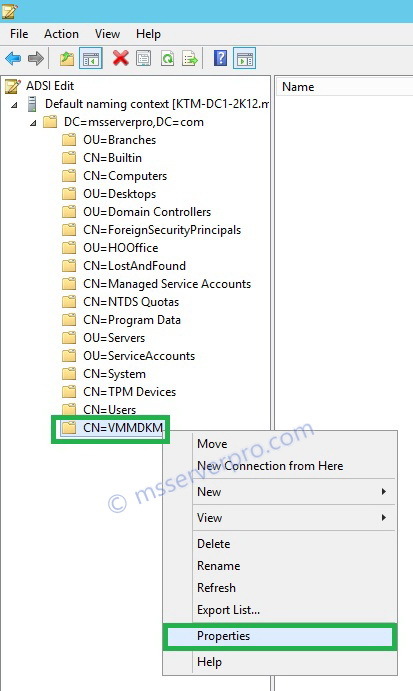 In the Select User, Computer, Service Account, or Group window, in the Enter the object name to select (Examples): dialog box type vmmsvc, click Check Names and click OK. 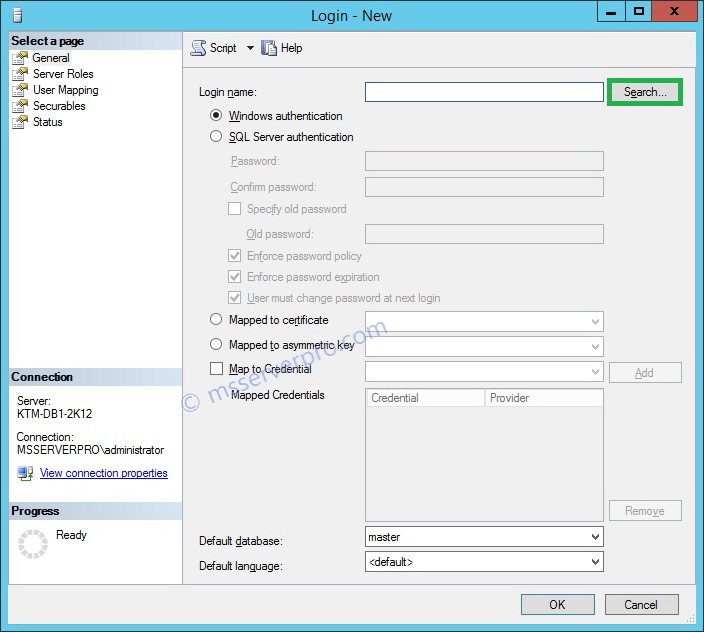 In the Login-New window, verify MSSERVERPRO\vmmsvc in Login name. 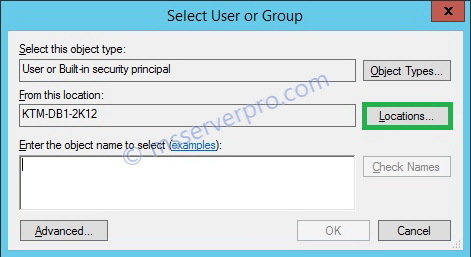 In the Login-New window, click Server Roles under Select a page, in Server role check dbcreator, processadmin, and securityadmin . Then click OK. 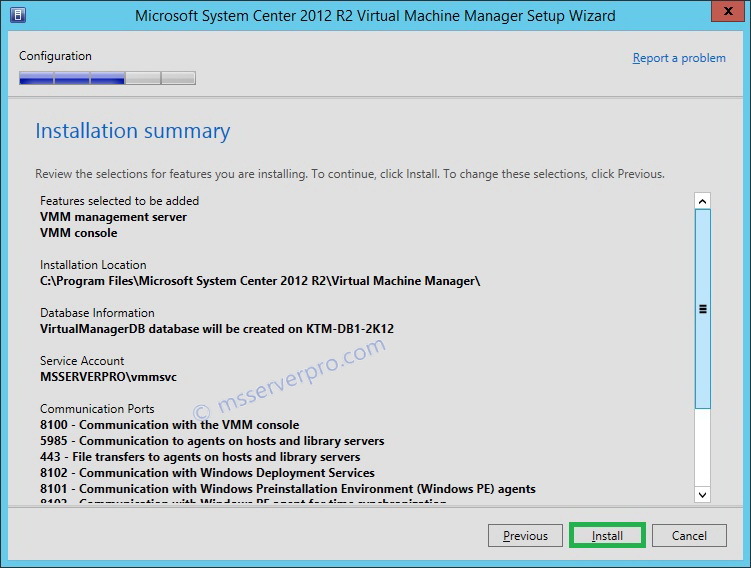 In VMM Server, KTM-VMM-2K12, Open Computer Management. 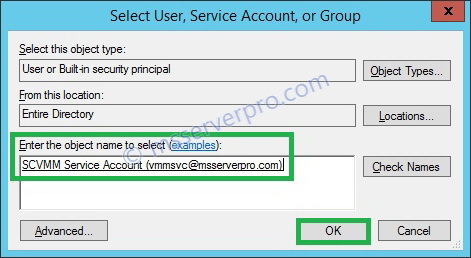 In Computer Management window, expand Local Users and Groups, click Groups > Double-click Administrators, add scvmm service account (vmmsvc@msserverpro.com) and click OK. 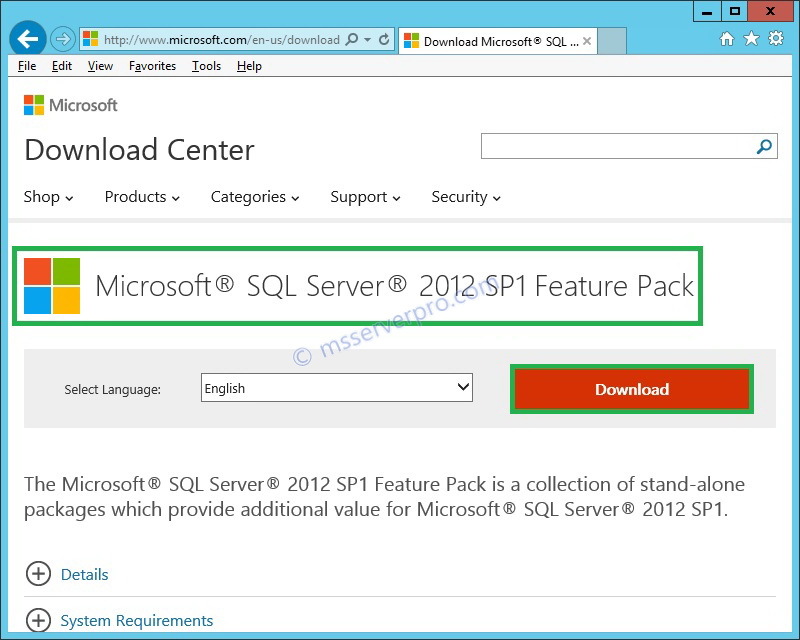 Install Microsoft SQL Server 2012 Feature Pack, SQL Server Command Line Utilities and Microsoft SQL Server 2012 Native Client. 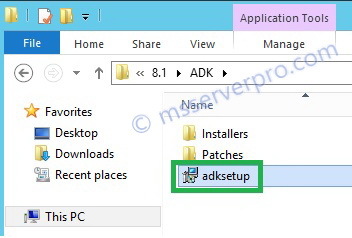 To begin ADK setup double-click on adksetup. 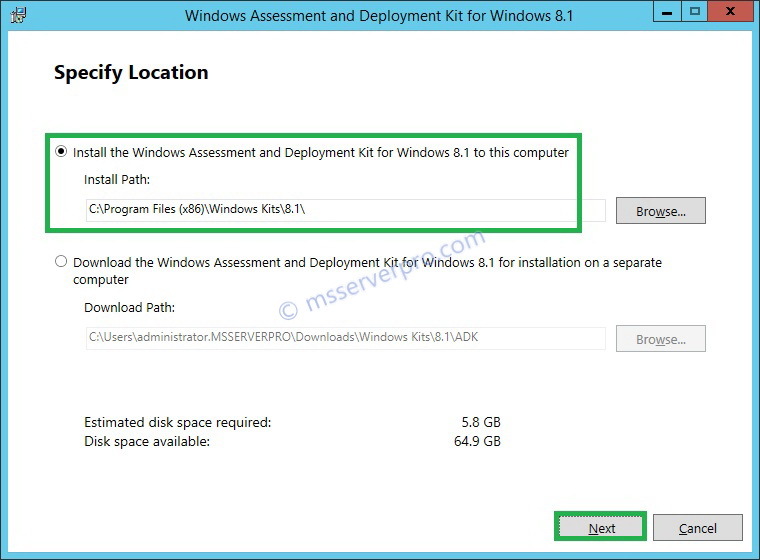 In the Windows Assessment and Deployment Kit for Windows 8.1 window, select Install the Windows Assessment and Deployment Kit for Windows 8.1 to this computer and click Next. 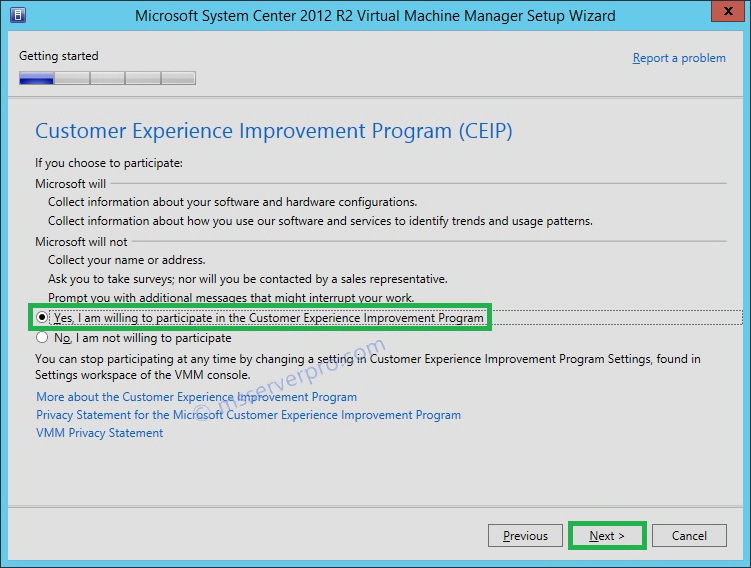 In the Join the Customer Experience Improvement Program (CEIP) window, select Yes and then click Next. 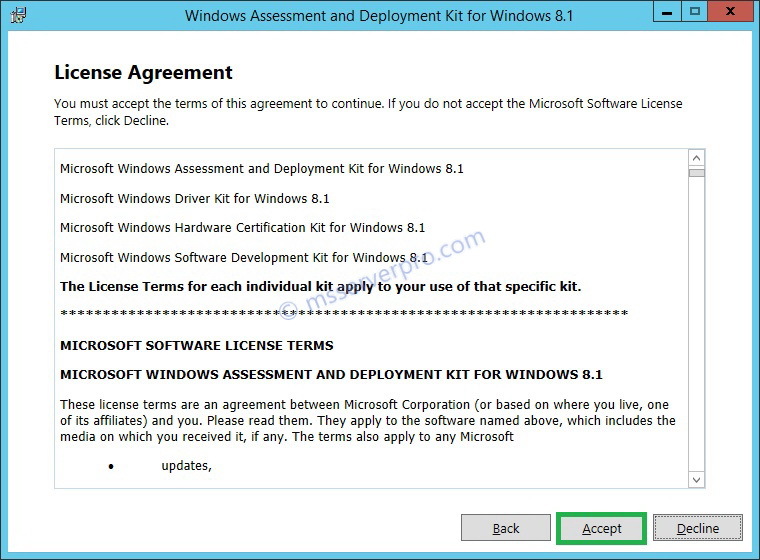 In the License Agreement page, click Accept. 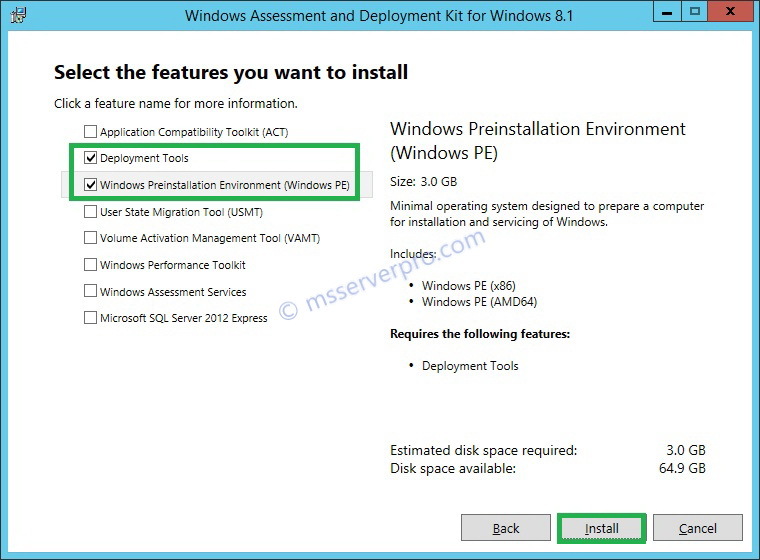 In the Select the features you want to install window, select Deployment Tools and Windows Preinstallation Environment (Windows PE) and click Install. 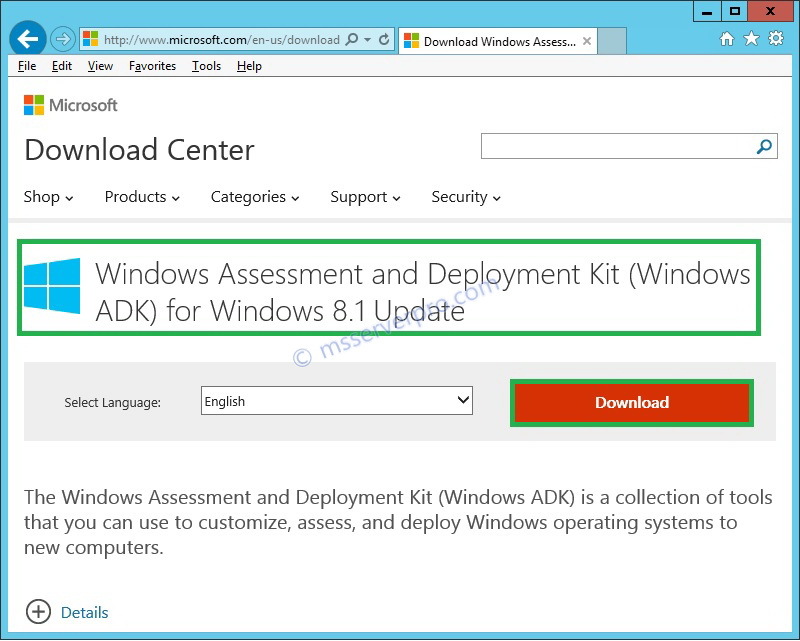 In the Windows Assessment and Deployment Kit for Windows 8.1 window, Installing features… begin. 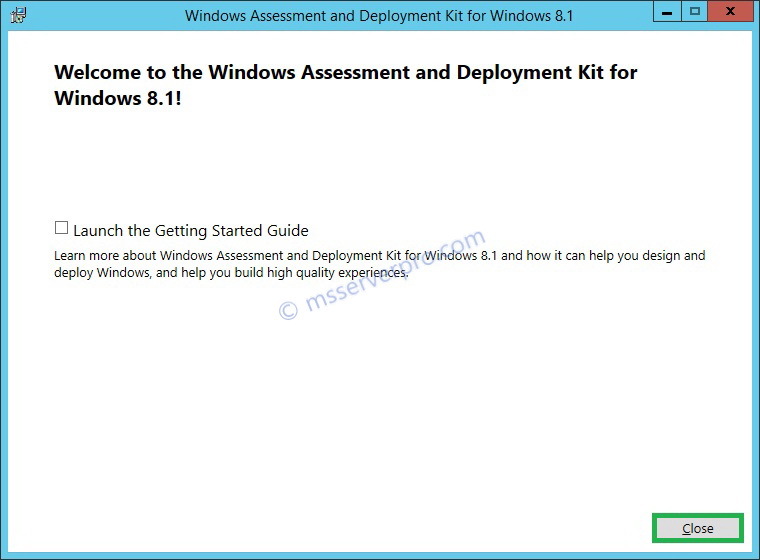 In the Welcome to the Windows Assessment and Deployment Kit for Windows 8.1! window, click Close. 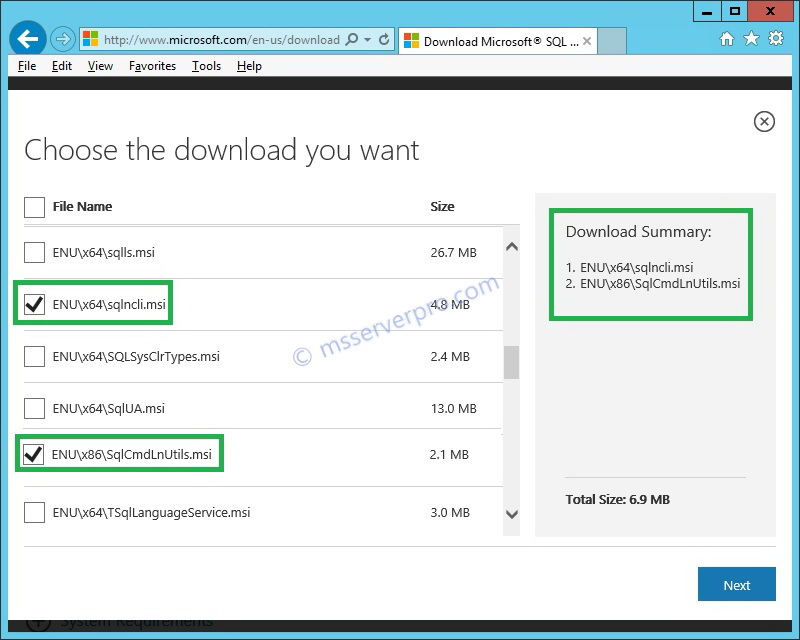 In the Choose the download you want window, check ENU\x64\sqlncli.msi and ENU\x86\SqlCmdLnUtils.msi and click Next to download. 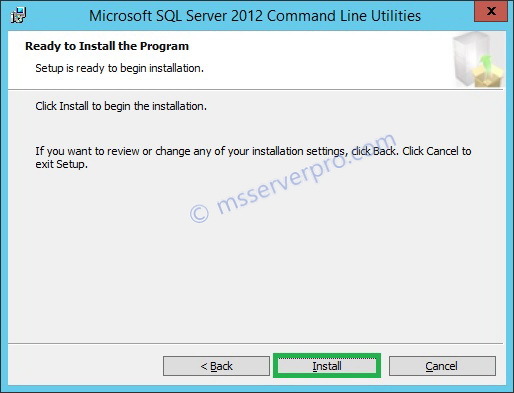 To begin sqlncli.msi setup, double-click sqlncli. 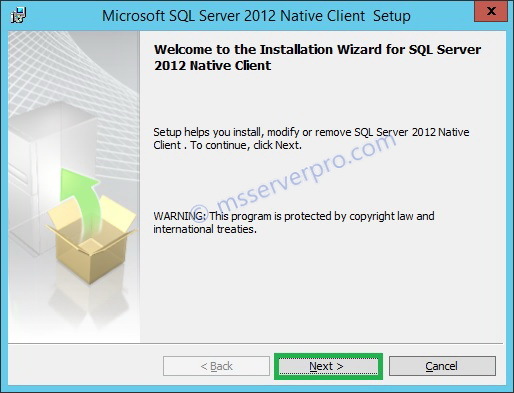 In the Welcome to the Installation Wizard for SQL Server 2012 Native Client window, click Next. In the Feature Selection window, click Next. 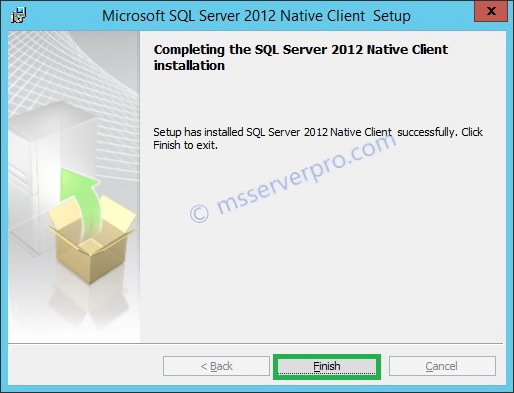 In the Completing the SQL Server 2012 Native Client installation window, click Finish. 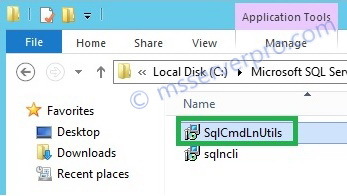 To begin SqlCmdLnUtils.msi, double-click SqlCmdLnUtils. 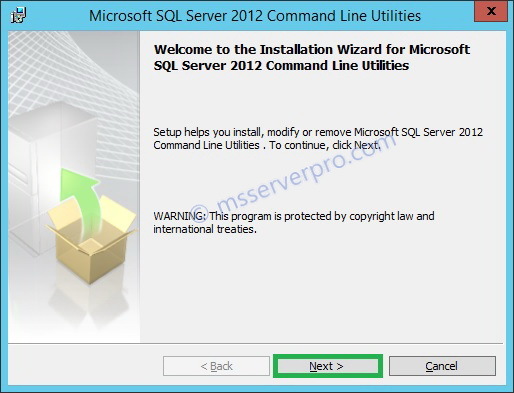 In the Welcome to the Installation Wizard for Microsoft SQL Server 2012 Command Line Utilities window, click Next. 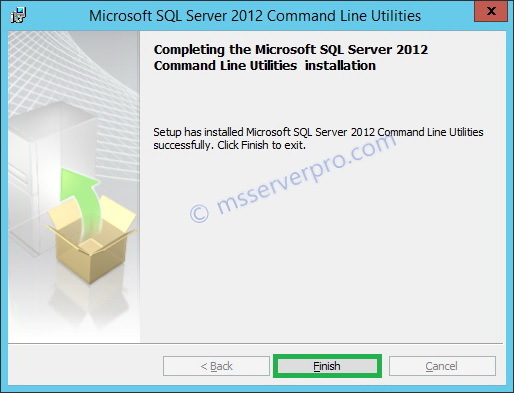 In the Completing the Microsoft SQL Server 2012 Command Line Utilities installation window, click Finish. 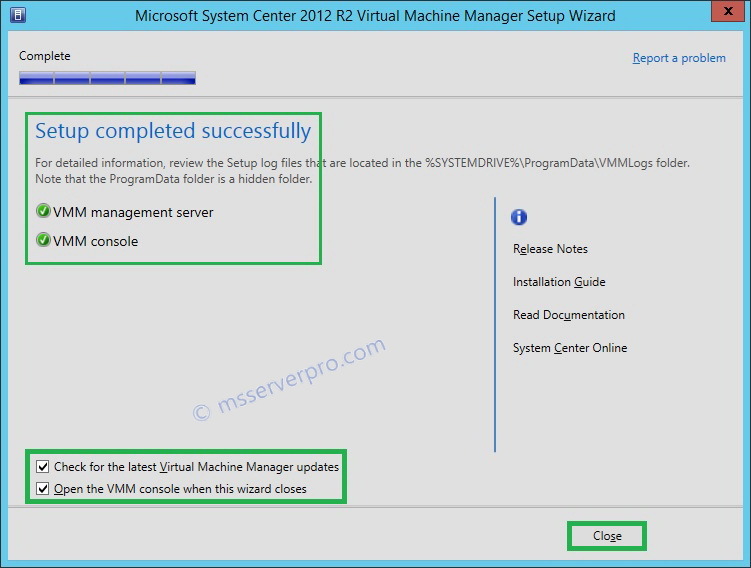 In VMM Server, KTM-VMM-2K12, to start the Virtual Machine Manager Setup wizard, on your installation media, double-click setup.exe. 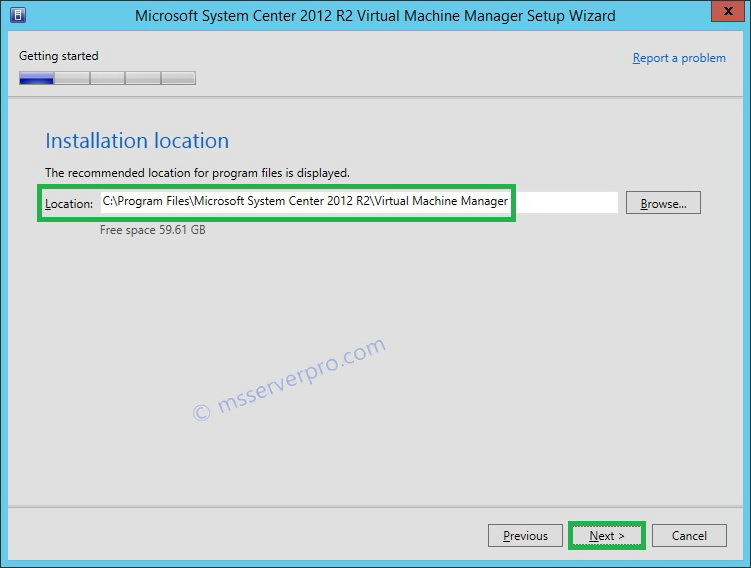 In the Virtual Machine Manager 2012 window, select Install. 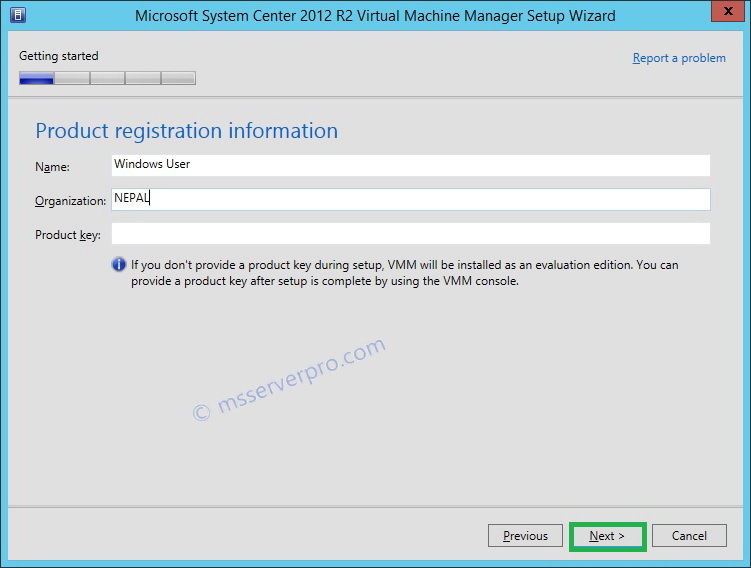 This starts the VMM Setup wizard. 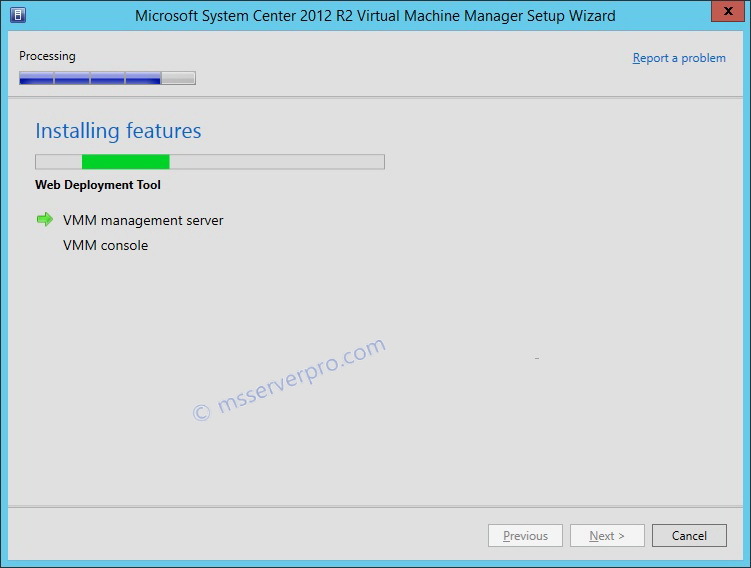 Virtual Machine Manager Setup begin..
selects VMM Console and then click Next. On the Product registration information page, provide the organization information and then click Next. 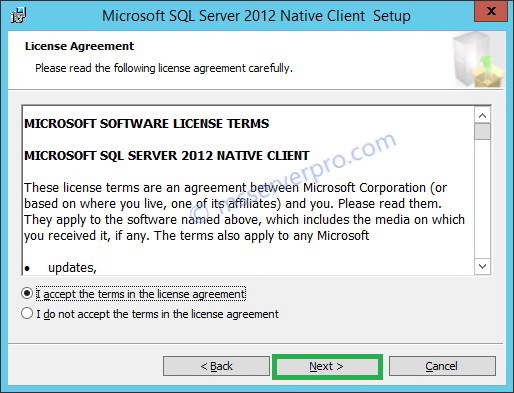 On the Please read this license agreement page, review the license agreement, select the I have read, understand, and agree with the terms of the license agreement check box, and then click Next. 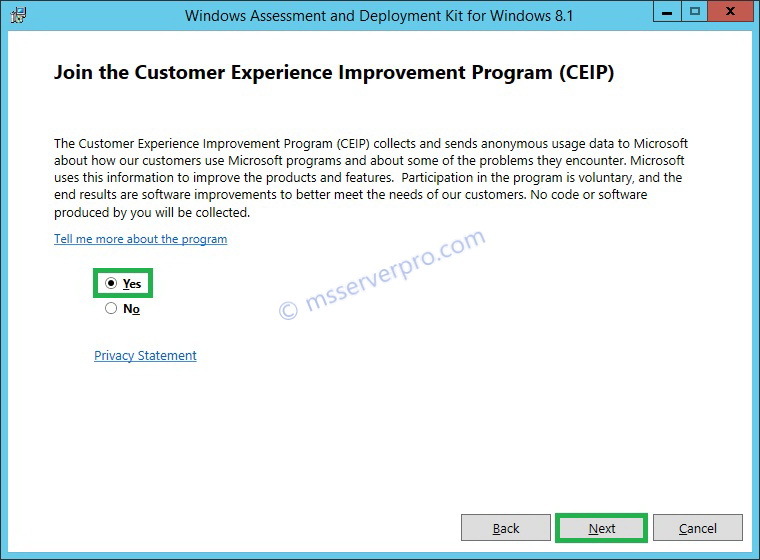 On the Customer Experience Improvement Program (CEIP) page, select the Yes, I am willing to participate in the Customer Experience Improvement Program check box, and then click Next. 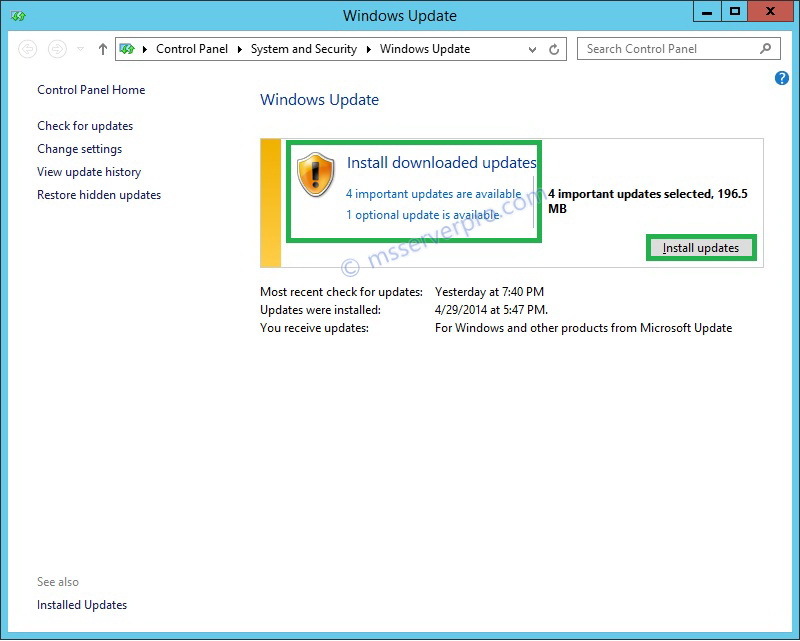 On the Microsoft Update page, select the On (recommended) and then click Next. 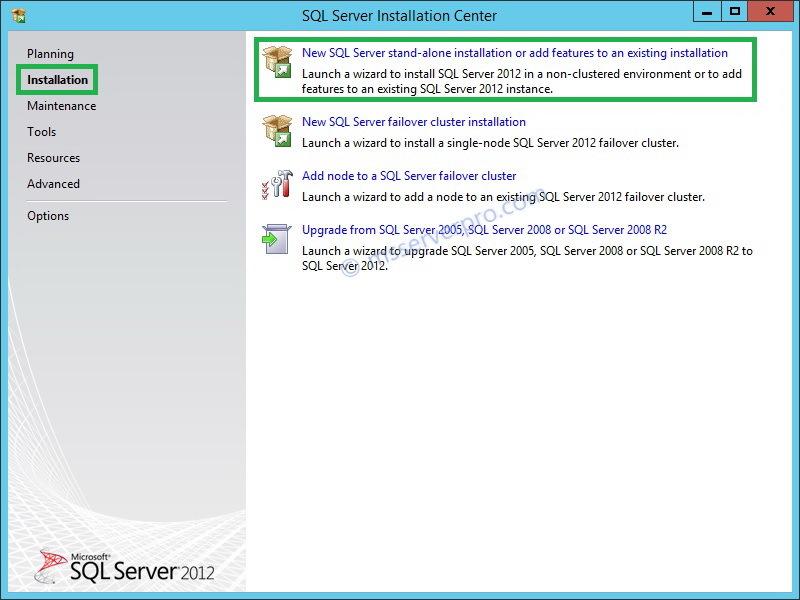 On the Installation location page, use the default location and then click Next. On Prerequisites page, wizard run Checking for required prerequisite hardware and software. 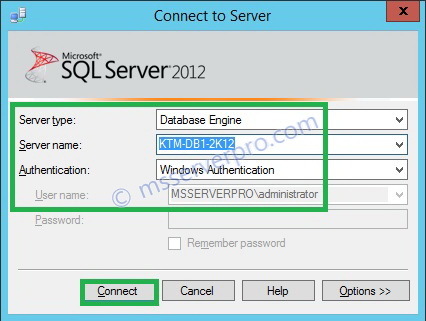 On the Database configuration page, in the Server name box, type KTM-DB1-2K12, which is the name of database server, select the Use the following credentials check box, in the User name and domains field, type msserverpro\vmmsvc and Password field, type P@ssw0rd. 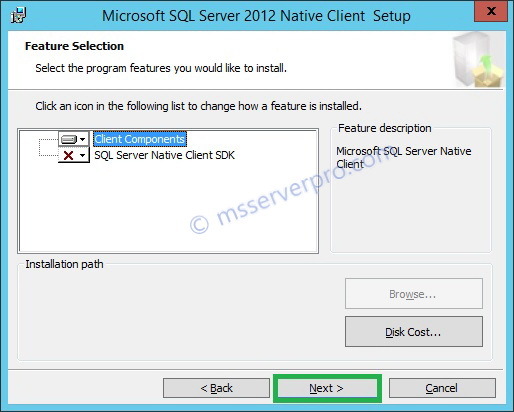 In the Instance name field, click the drop-down arrow, and then click MSSQLSERVER. 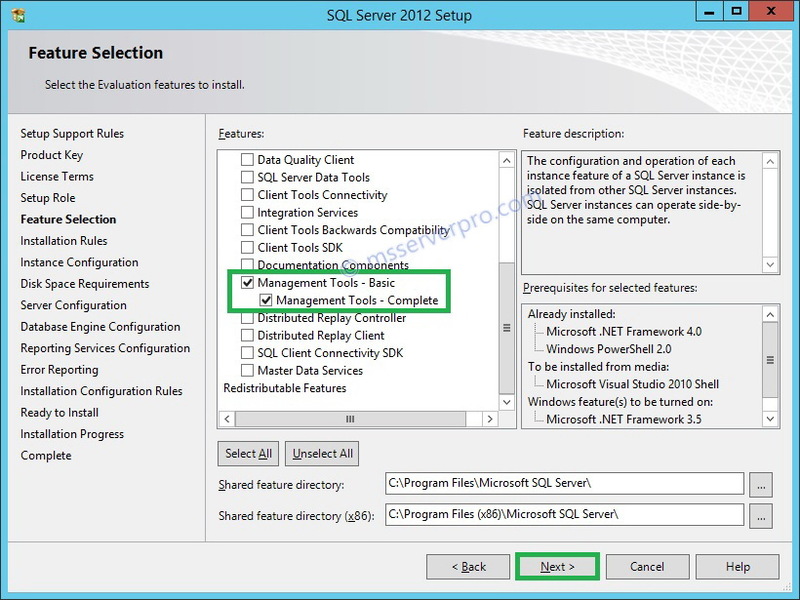 In the Select an existing database or create a new database area, use the default New database VirtualManagerDB, and then click Next. 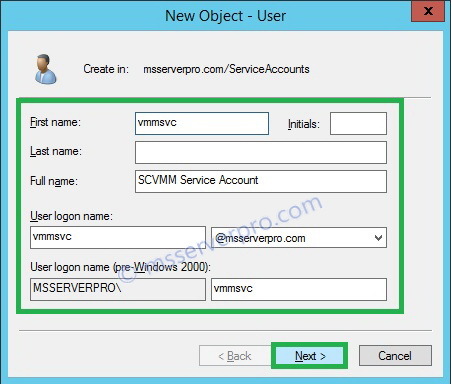 On the Configure service account and distributed key management page, in the User name and domain field, type msserverpro\vmmsvc , and in the Password: field, type P@ssw0rd. 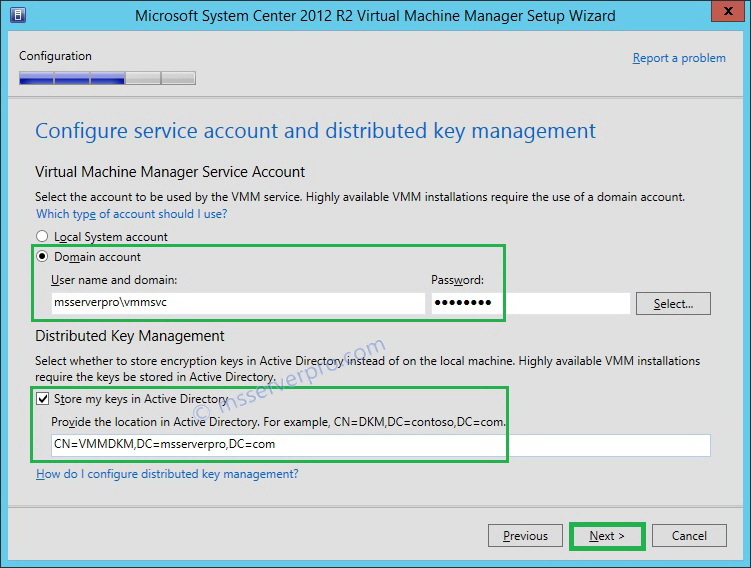 In the Distributed Key Management section, select Store my keys in Active Directory check box, type CN=VMMDKM,DC=msserverpro,DC=com and then click Next. 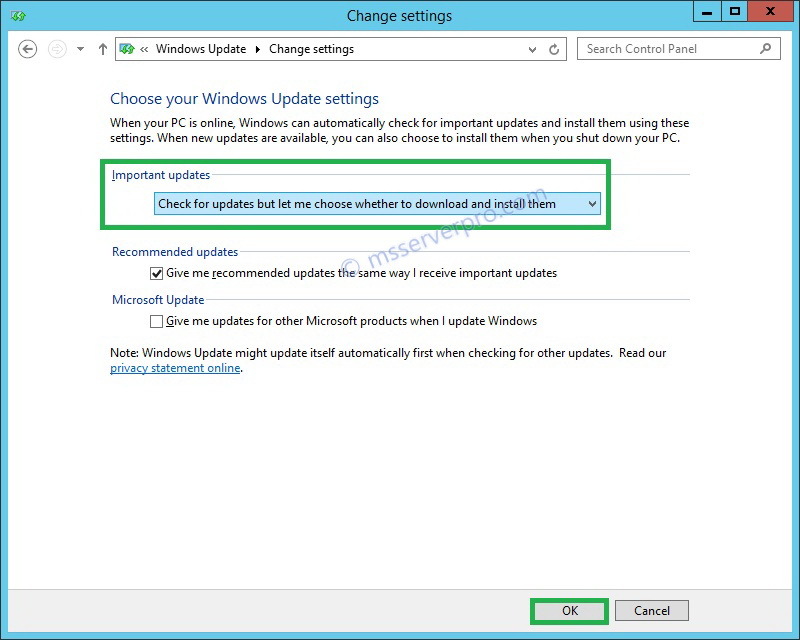 On the Port configuration page, do not make any changes and then click Next. 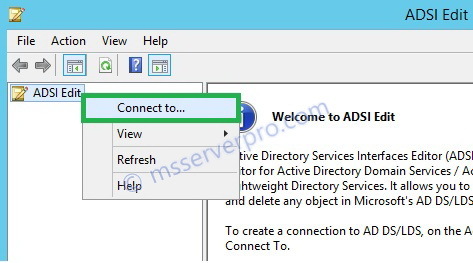 On the Library configuration page, select the Create a new library share and change the default Share location path to D:\MSSCVMMLibrary and then click Next. 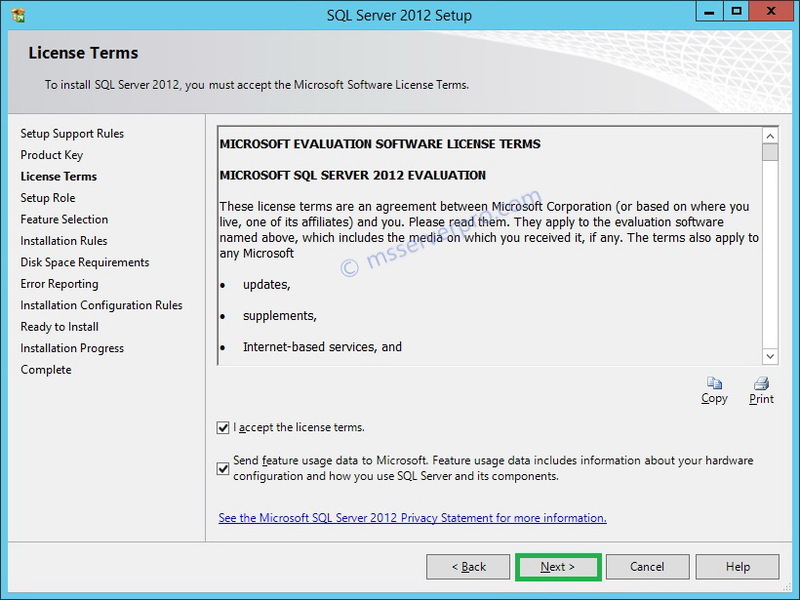 In the Installation summary page, review the text and then click Install. 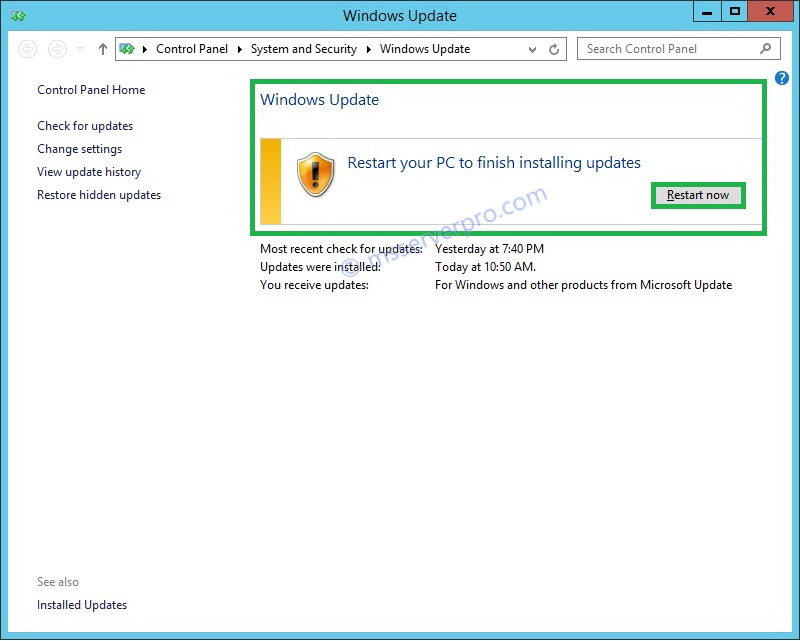 The Installing features will now run for several minutes. 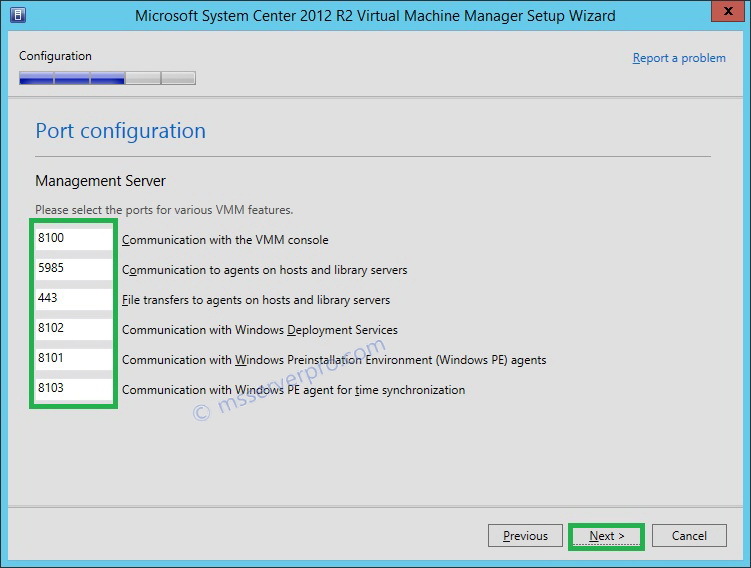 On the Desktop, click the Virtual Machine Manager Console icon. 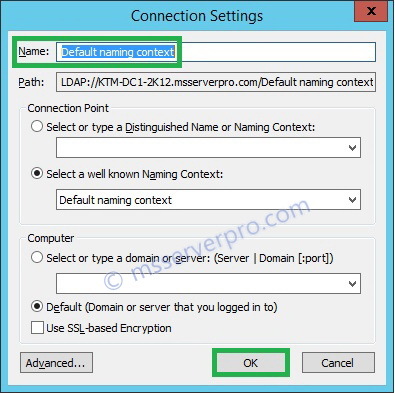 In the Connect to Server pop-up window, verify that the Server name field is set to localhost:8100 and select Use current Microsoft Windows session identity and then click Connect. 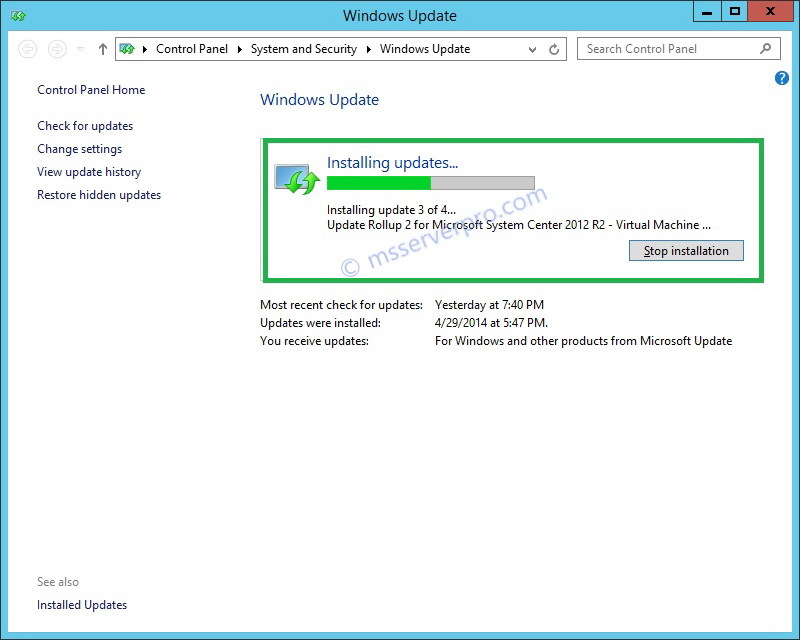 Wait for the Virtual Machine Manager console to open. 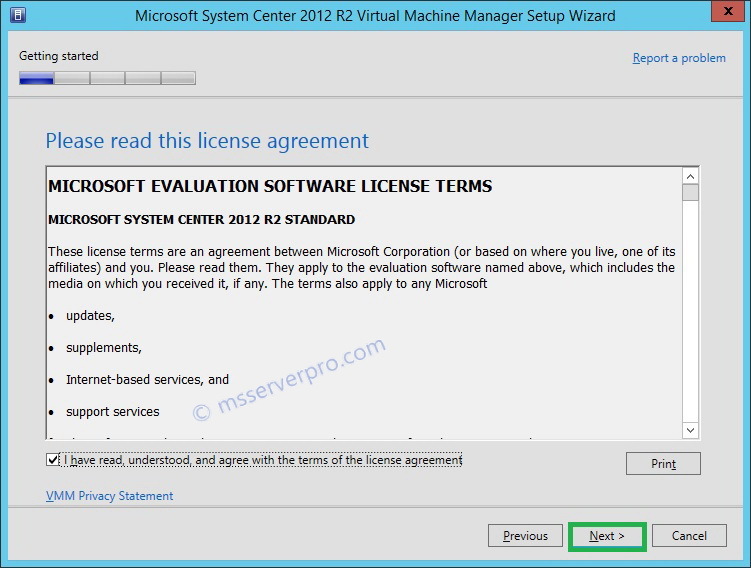 I hope this article will be more helpful during the installation of System Center Virtual Machine Manger 2012 R2 in Windows Server 2012 R2. It is a very great tutorial. 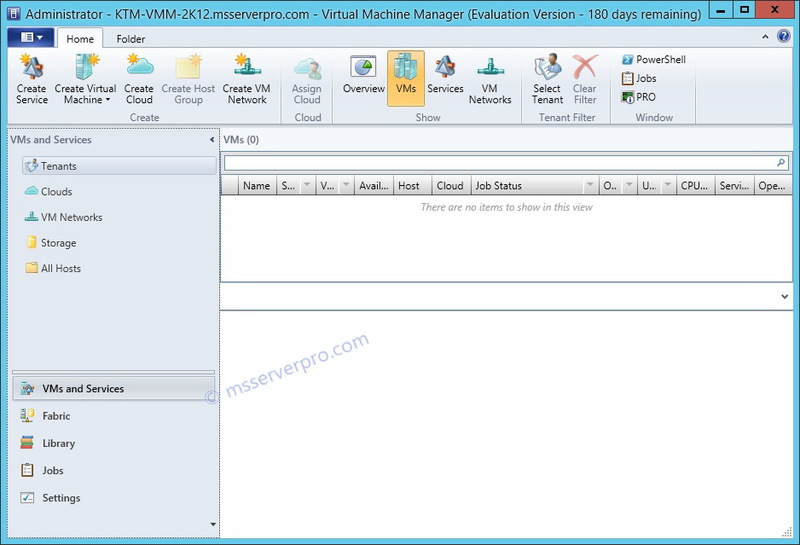 I think that Microsoft has done a poor job of documenting Virtual Machine Manager. Thank you very much for this great tutorial! Great Tutorial Thanks a TON!! !